A week before departure I developed ‘shingles’. 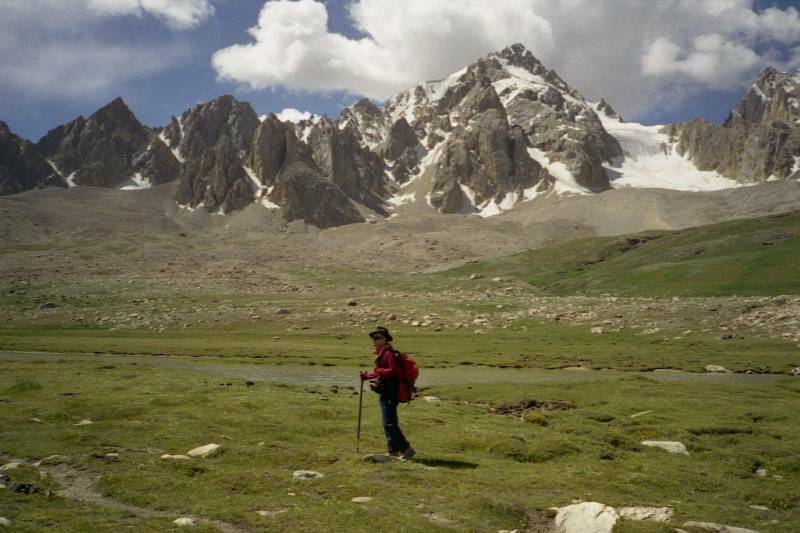 Having confirmed that it was not contagious and after consulting other party members, I decided, despite possible irritation by my rucksack, not to withdraw from the trek. 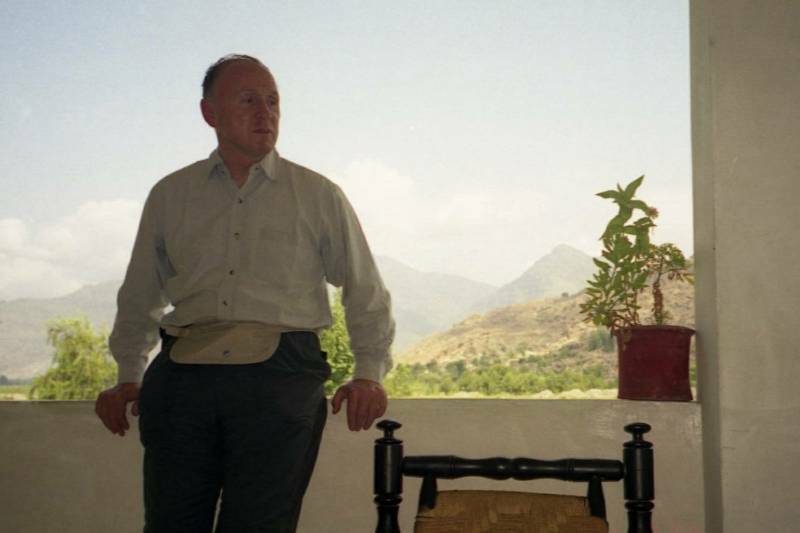 We left England for Pakistan on the 30th June on two separate flights. 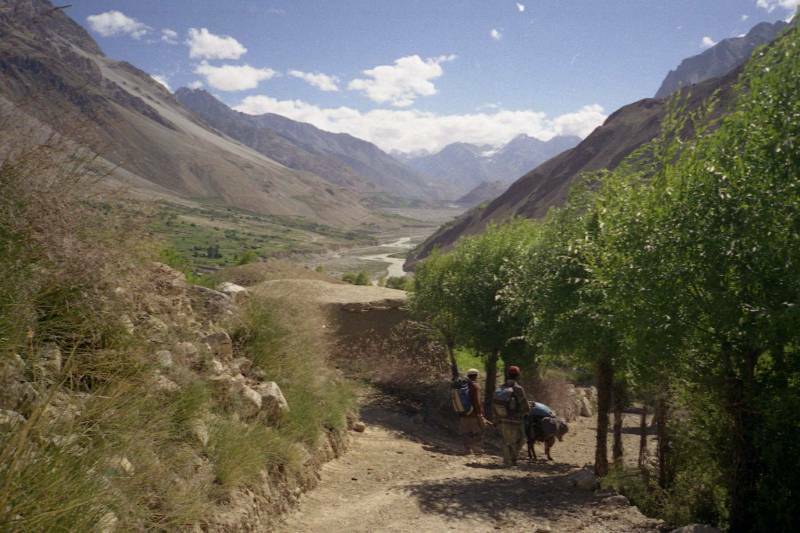 Our trek was through the Hindukush in the north of Pakistan between Rua and Ghotulti – small villages you are unlikely to find on maps of Pakistan - not too far south of the Afghanistan border. 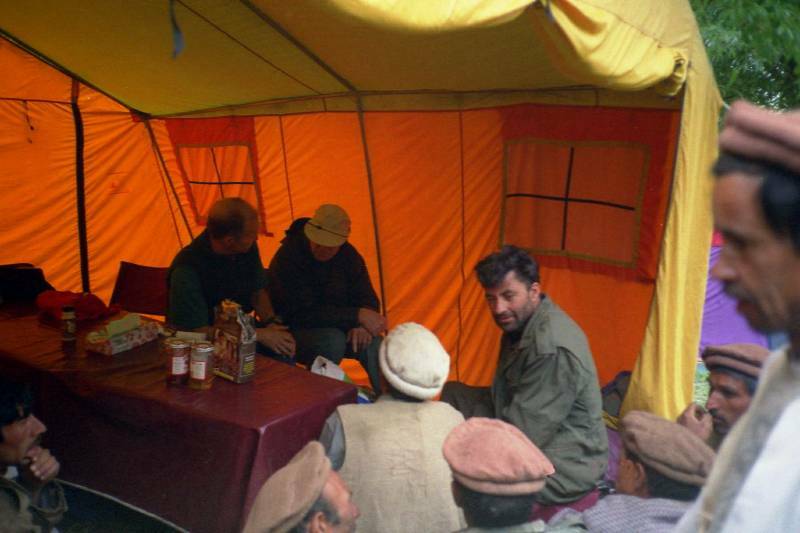 Christopher, the trek organiser and leader, had worked some years earlier in Islamabad and had visited the northern areas before but not had time to go trekking. 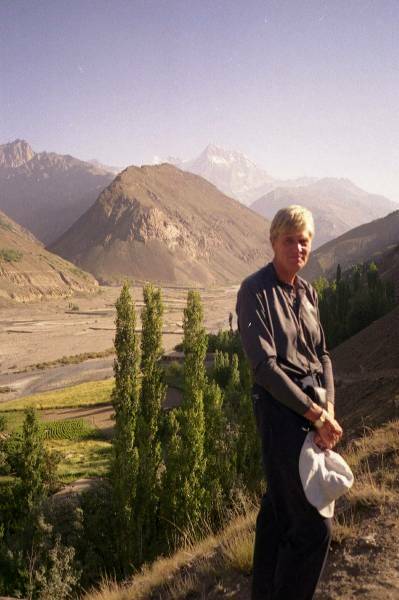 Later back in England he researched and agreed an imaginative route with the Pakistani trekking company Hindukush Trails. 5 British people, all over 60 years old, Christopher, Pyers, me Tony, and couple Sophia and Charles, together with a French couple, Jean Yves and Michelle, about 50 years of age, made the final party. Other potential participants had withdrawn citing ailments or different reasons. 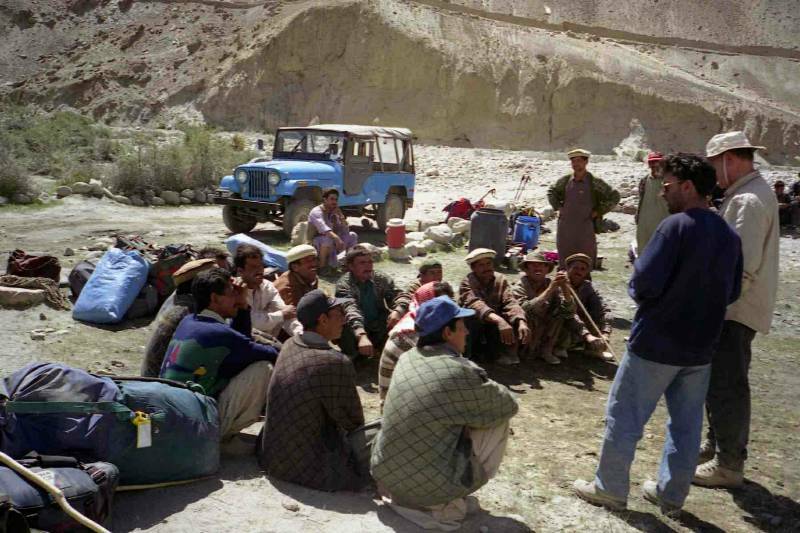 Arranging the trek and getting people to commit had taken over 6 months. Communications between the parties was conveniently and inexpensively done by email. This was for me a return visit to Pakistan, almost 38 years earlier I had worked on the construction of the Mailsi Siphon barrage. 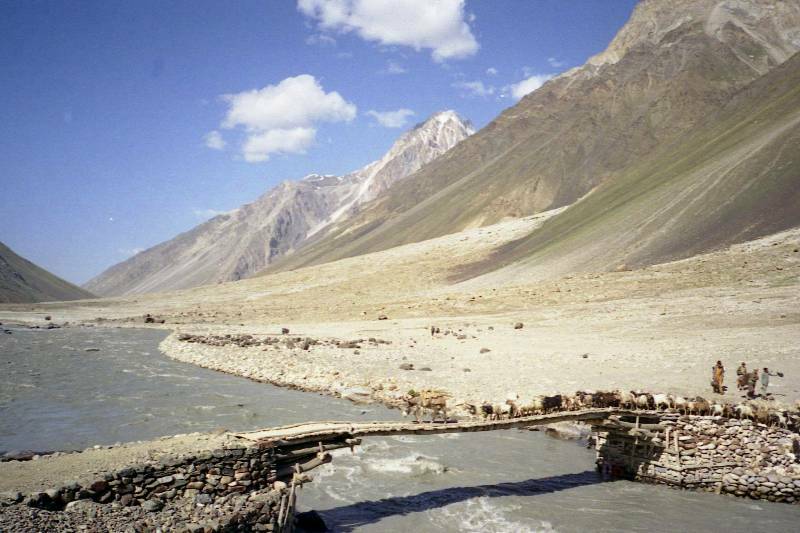 The barrage incorporated an inverted siphon enabling a new canal to cross the Sutlej River bed. 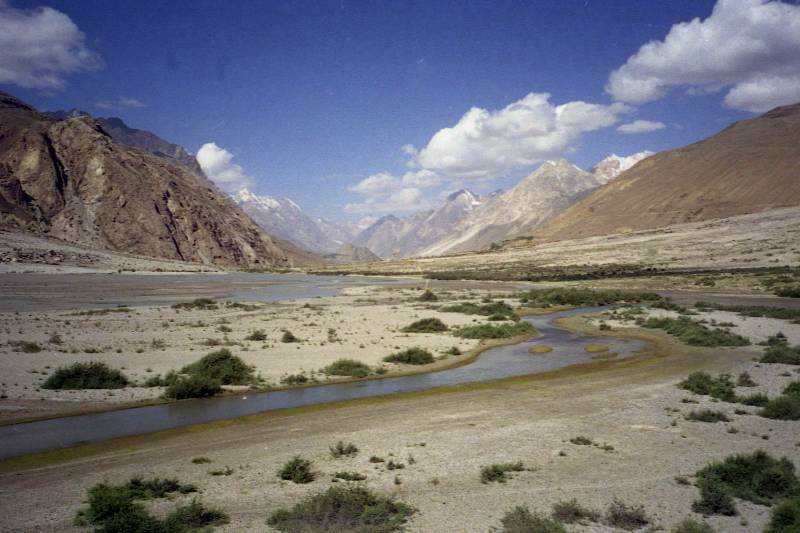 It was one of many projects in the Indus Basin Scheme financed by the World Bank to replace irrigation water supplies cut off from India after the partition of the sub continent in 1947. Mailsi near the ancient city of Multan is in the Punjab desert where the temperature reaches 46C in the summer. 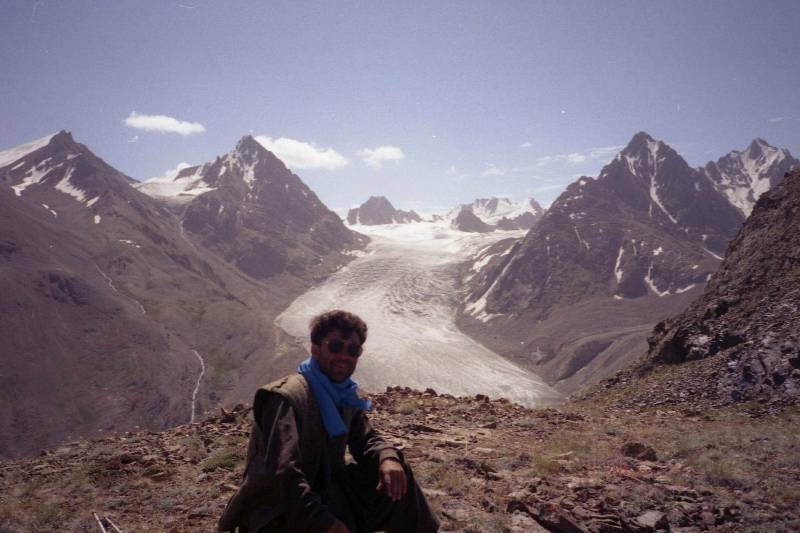 Here I was told of the mountains near Gilgit some of my co-workers had visited to escape the heat of the plains and had also hoped to visit there one day. 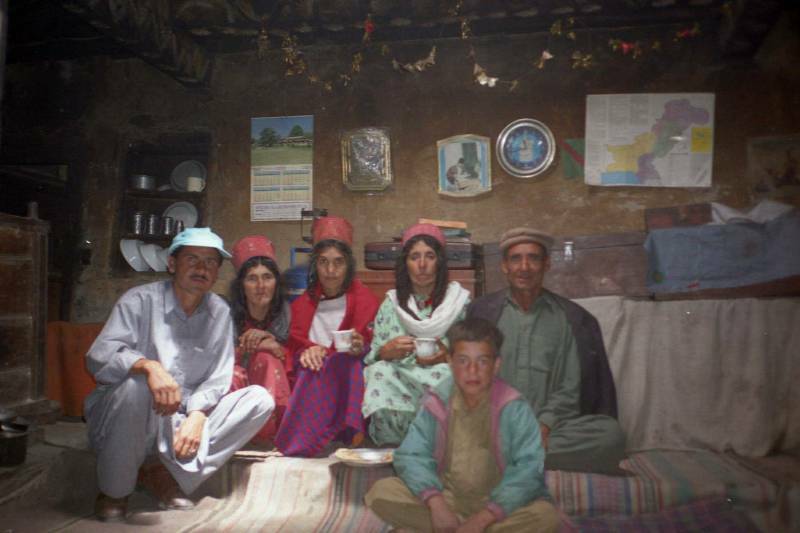 Top left chief guide, Murad Khan - Top right assistant guide Jagir Khan - bottom head cook Kareem (behind stove) and assistant Ibrahim. 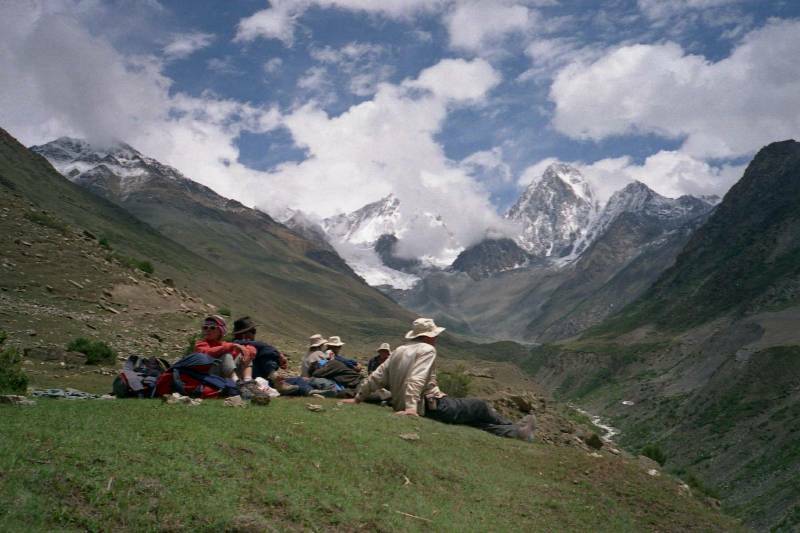 Lunch time break on first trekking day. 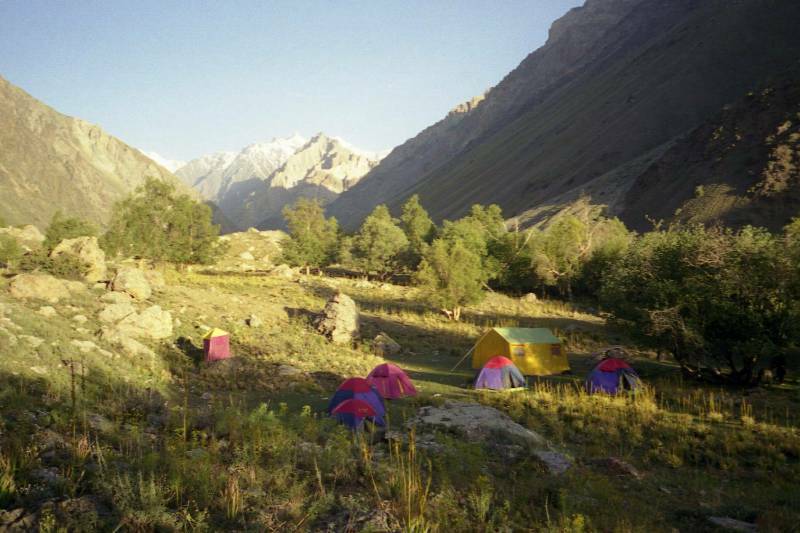 Hindukush Trails provided competent and friendly guides Murad and Jagir (both with last names Khan), and a cook Kareem and assistant Ibrahim. 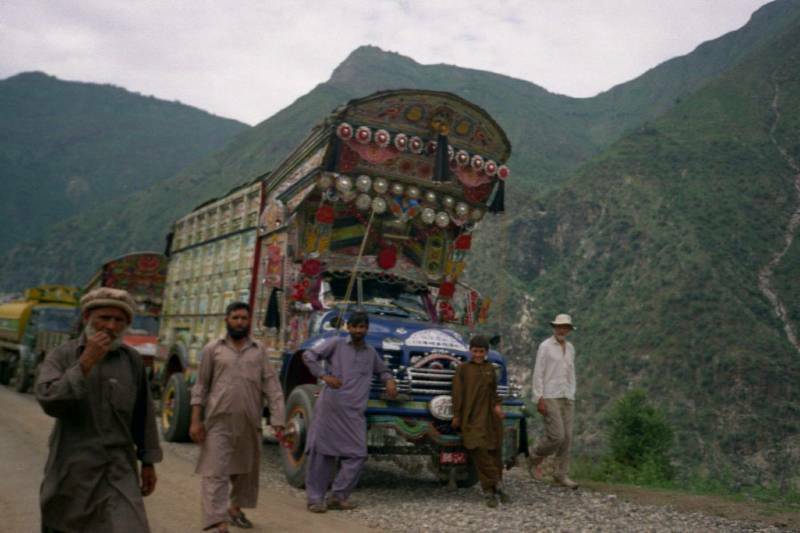 Transport by bus and jeep and hotel stays in Islamabad, Chitral (and Gilgit after the trek) were arranged by them. 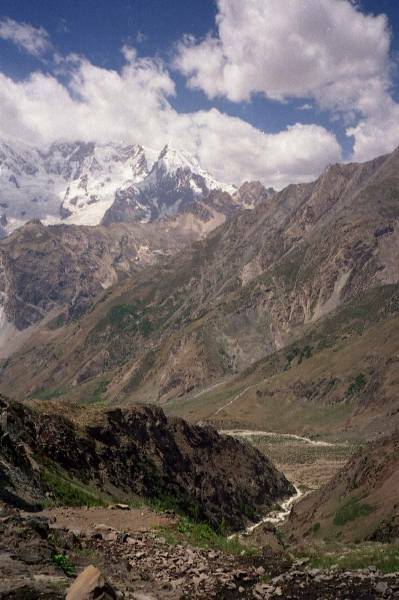 After a long bus ride from Islamabad we changed to jeeps to reach Chitral over the unsurfaced Lowari pass only open in summer. Descending this pass, we saw teams of men hacking out blocks of compacted snow from gullies. We saw these frozen blocks later sold in the Chitral Bazaar. 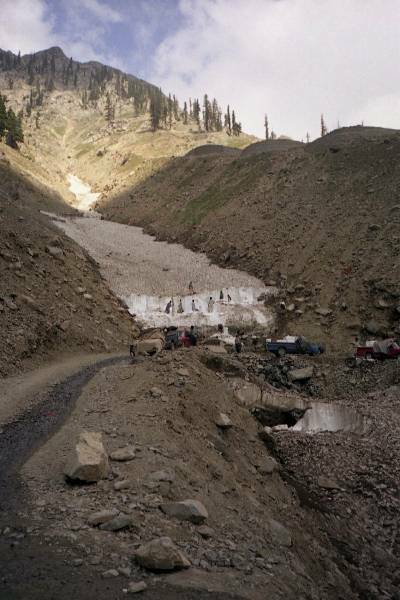 In winter this pass is blocked and the only road route is then through Afghanistan. 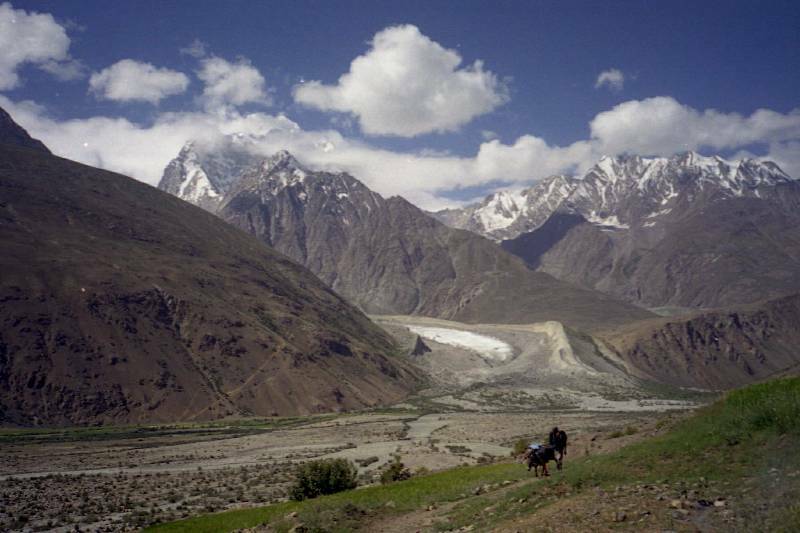 An alternative route to Chitral is by air, flights being scheduled daily from Peshawar. 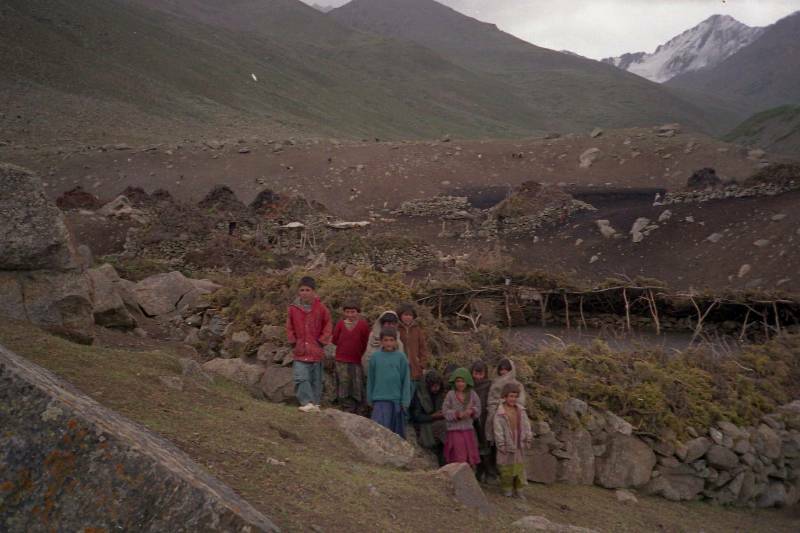 But they apparently are frequently affected by poor weather over the mountains. 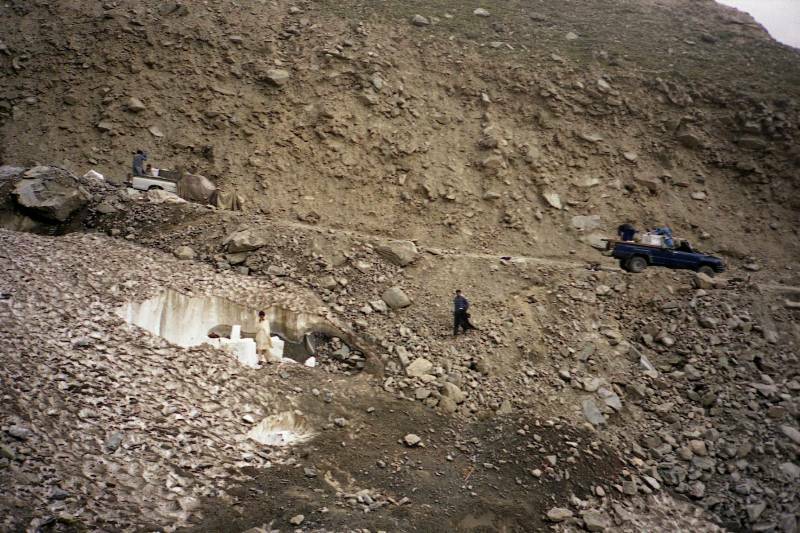 Chopping out ice blocks in gully near Lowari pass road descending into Chitral. 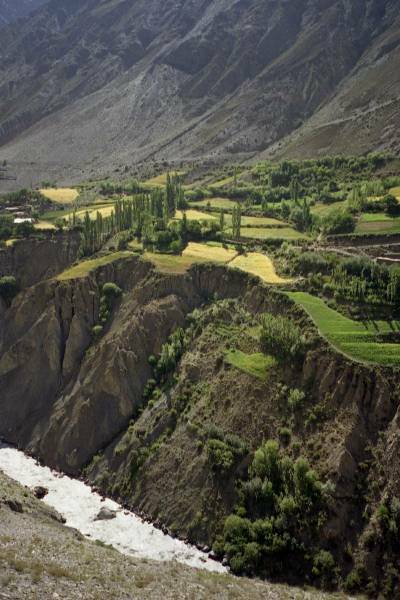 Cultivated terraced fields near Chitral. 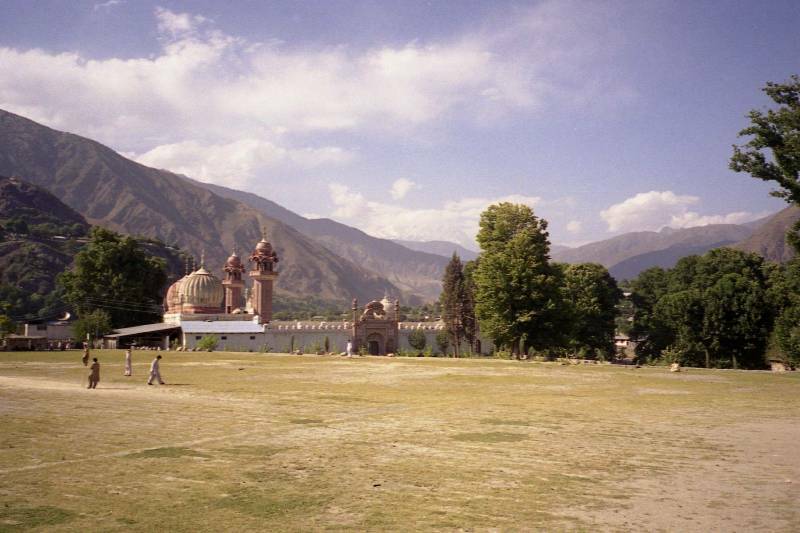 The mosque with cricket field in foreground. 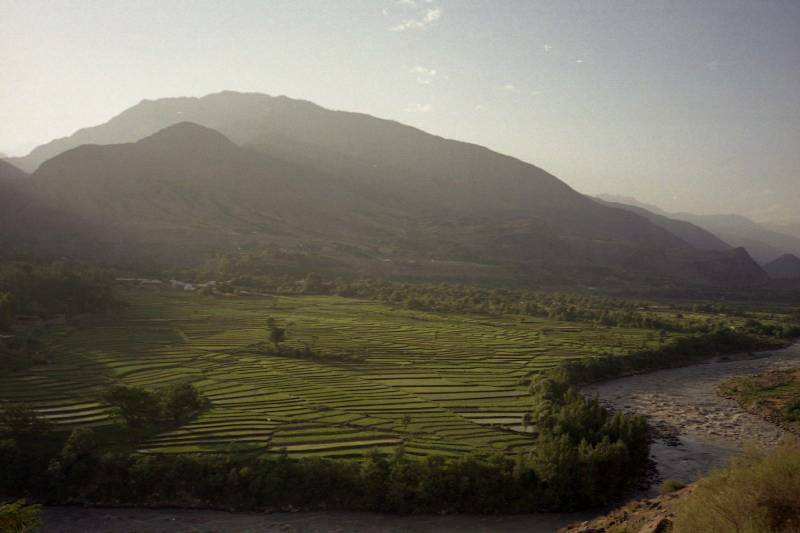 At Chitral we rested a day in a delightful new hotel, Hindukush Heights, overlooking the river, town and airfield in the valley below. We enjoyed Pakistani food and visited the town, the bazaars, the historic fort, and the Chitral Scouts cantonment where we had tea and looked at interesting memorabilia both of the British Raj and after Pakistan’s independence. Near the fort, youths were playing cricket on a dusty field and in the distance, beyond the mosque, the white peak of Tirich Mir towered. 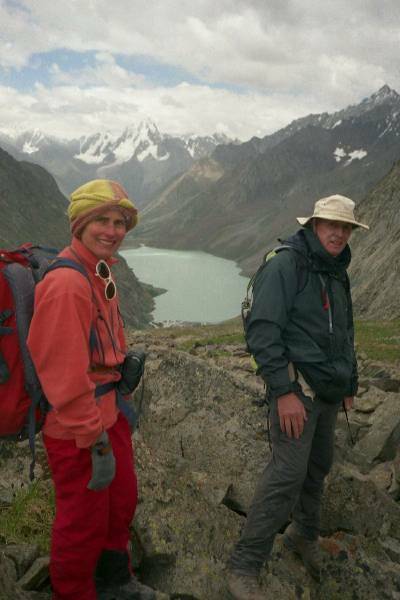 Before we left Chitral Jean Yves and Michele’s baggage which had gone astray between Marseilles to London to Islamabad caught up with them 4 days late – it had to be sent up separately by road from Islamabad – without their gear the trek would have been seriously disrupted. 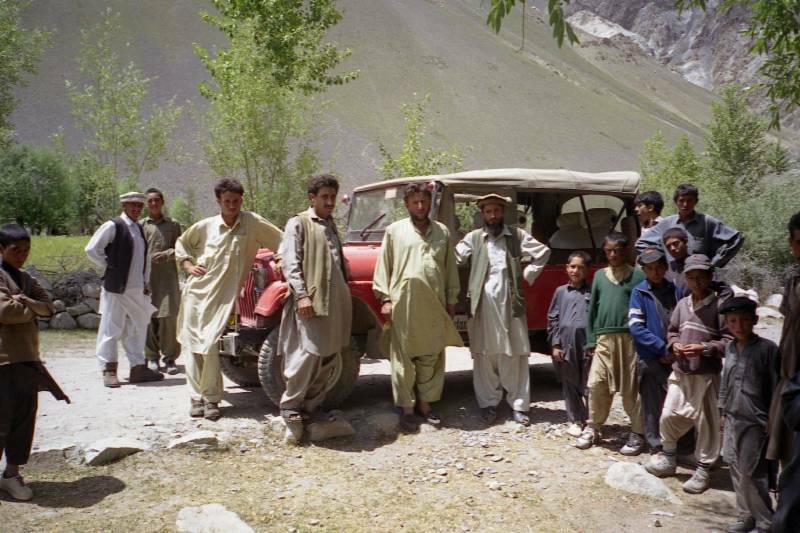 Pictures taken on jeep drive in from Chitral via Zanglast to Rua the start of the trek. Further jeep 'drive in' pictures en route to Rua. Note the timber log cantilevers / central trussed steel drop in span bridge taking jeep loads. 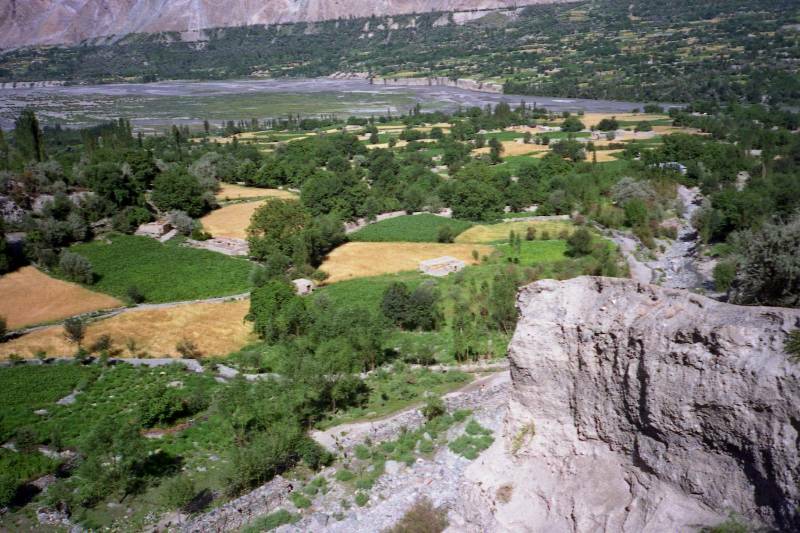 After a further 1½ days of bone shaking travel north of Chitral, often along very scary jeep tracks carved into mountainsides perched above rivers glinting and sparkling below, we reached Rua and the walk started the next day. In all we covered a distance of about 112 miles (measured on small scale maps) in about 13 days - with 3 rest days – 16 days of trekking in all. My pedometer, set conservatively at a 2 foot per pace, indicated about 144miles giving an average of 11miles per walking day. This included for bends, and zigzagging not measurable on the small scale maps. The daily walking time varied for each person, but I covered this distance in about 88 hours including for midday meals and other stops – an average overall walking rate of nearly 1.6 miles per hour. 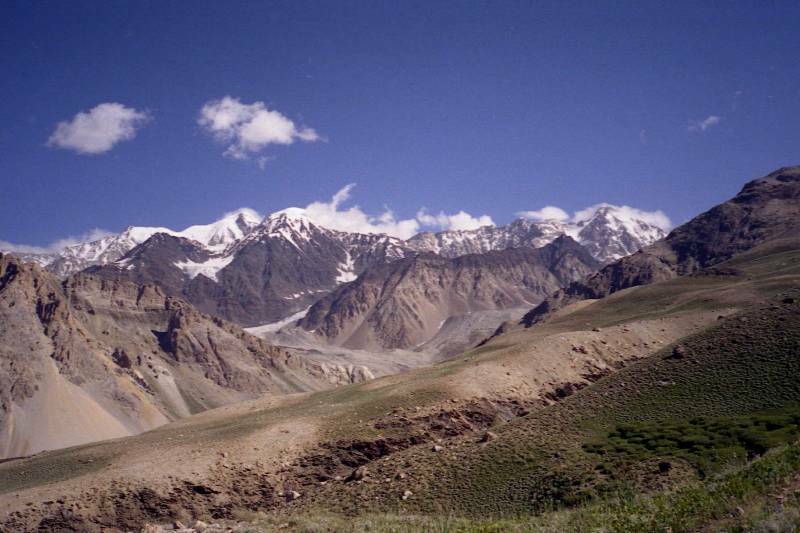 It was fairly tough going since three mountain passes – Shah Jinali at 4259m, Zindikar at 4670m, and Atar at over 4590m above sea level were crossed. 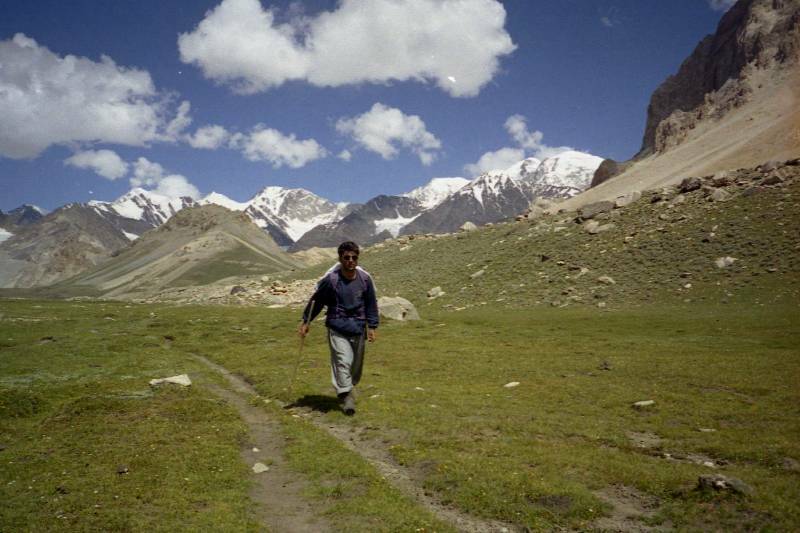 The Atar pass was apparently very seldom crossed and our guide had only traversed it 4 to 5 years earlier. Between passes many ups and downs were traversed in rugged country. (See table at end giving statistics). Goats following us over our first 'walking' bridge crossing. Lunch stop on our first day. 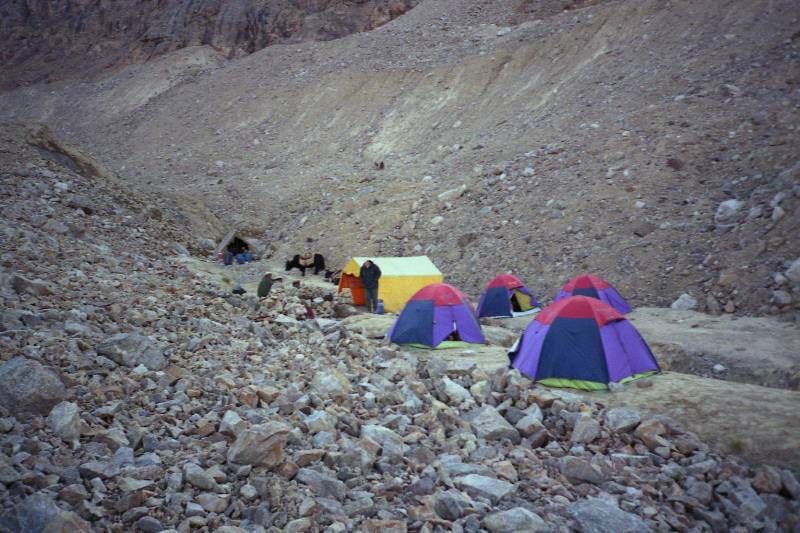 Our camp pitched at Dershel by the porters at the end of our first day. 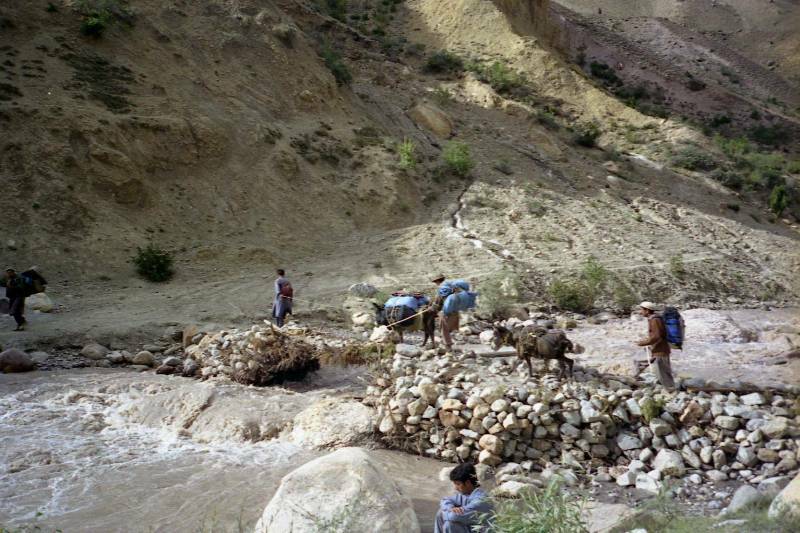 Three separate sets of porters were hired from local villages along the way to carry tents, food and the bulk of our personal gear. We each carried a small daypack with water, snacks and clothing against poor weather. 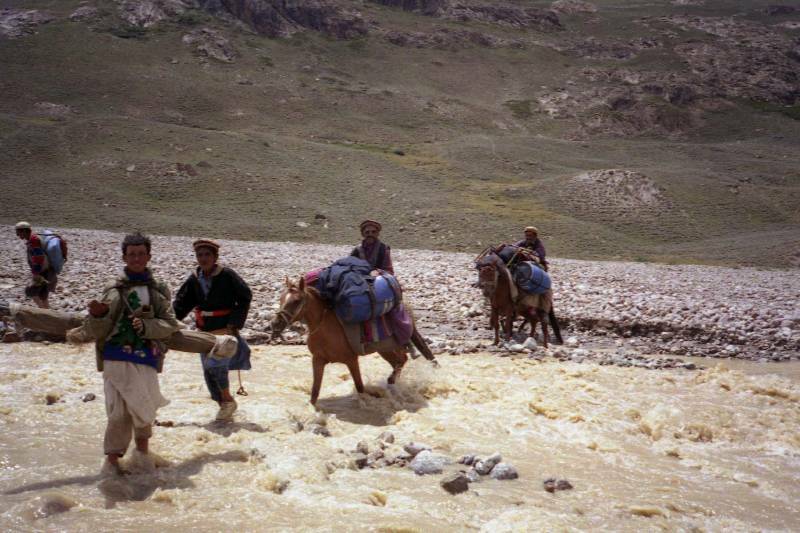 Despite their heavier and often clumsy loads of about 27kg, the porters who started each day after us, soon overtook us, the cooks making lunch and tea on route. 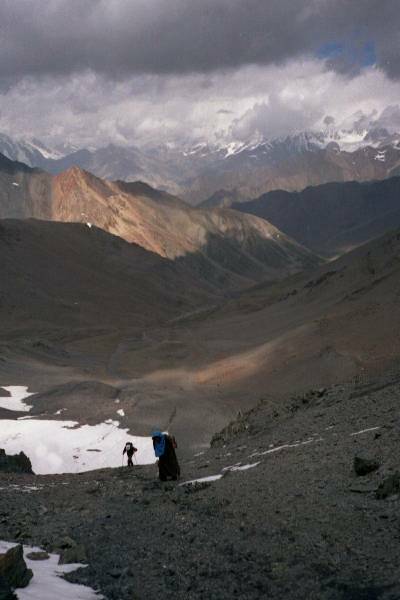 But towards the end, as we got fitter we kept in front of the porters far longer. 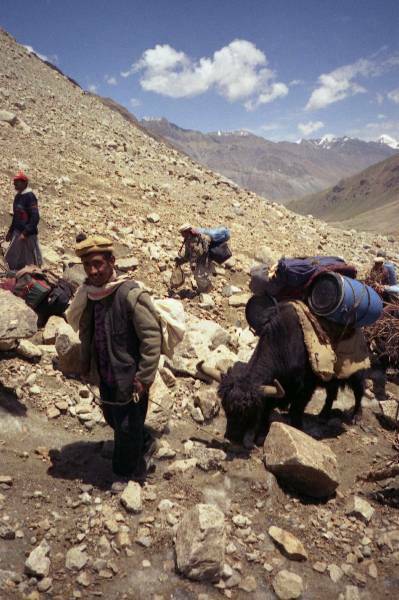 Porters covered their local areas so that they could return home reasonably quickly retracing their steps. They would often entertain themselves and us in the evenings with songs, narrating stories, and with dancing accompanied by drumming and hand clapping. Exact location of these pictures not clear - either between Rua to Deschel or Deschel to Shah Gari? 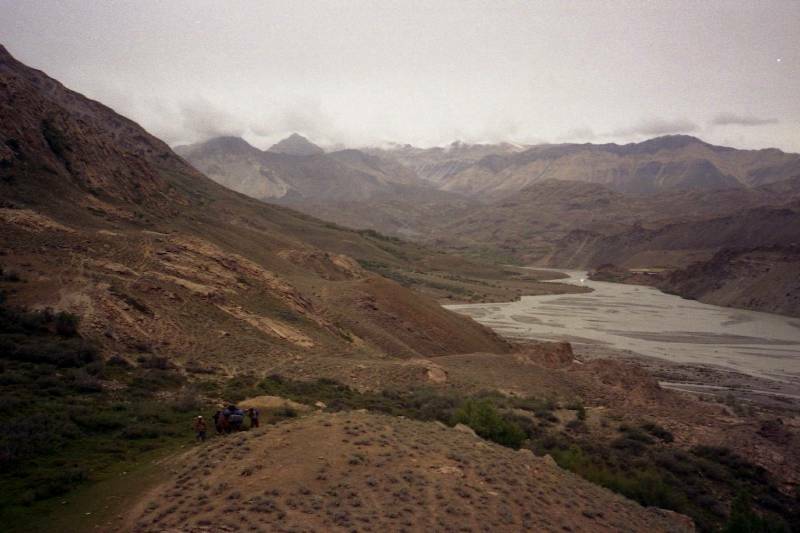 Because of a gradual approach up the mountains no one suffered from altitude sickness. A few nose bleeds were the only signs of gaining height. Walking was more rugged than I have encountered anywhere else. 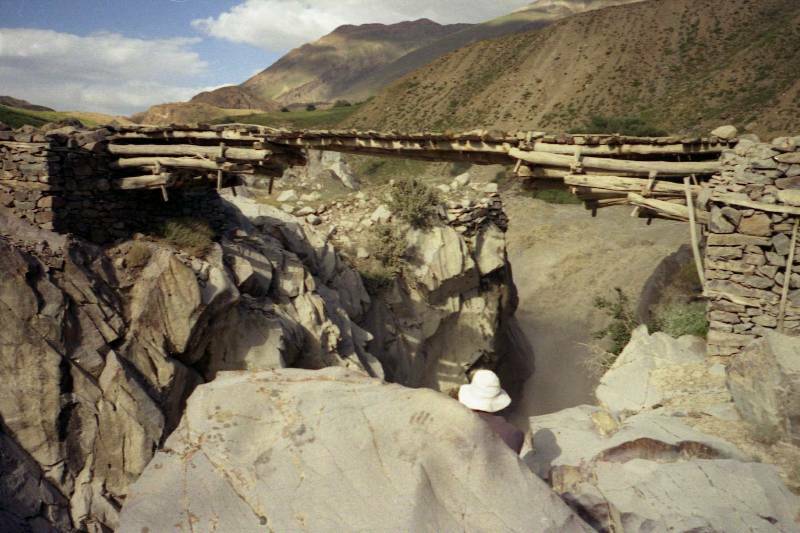 Frail bridges without side barriers over angry impatient rivers and narrow paths zigzagging up steep unstable mountain screes had to be negotiated. On these I made good use of my two telescopic trekking poles for balance and stability. The chief guide interestingly commented that persons seen on treks with two poles were usually French – if they used one pole only they were probably British - our party did not conform with this generalisation. 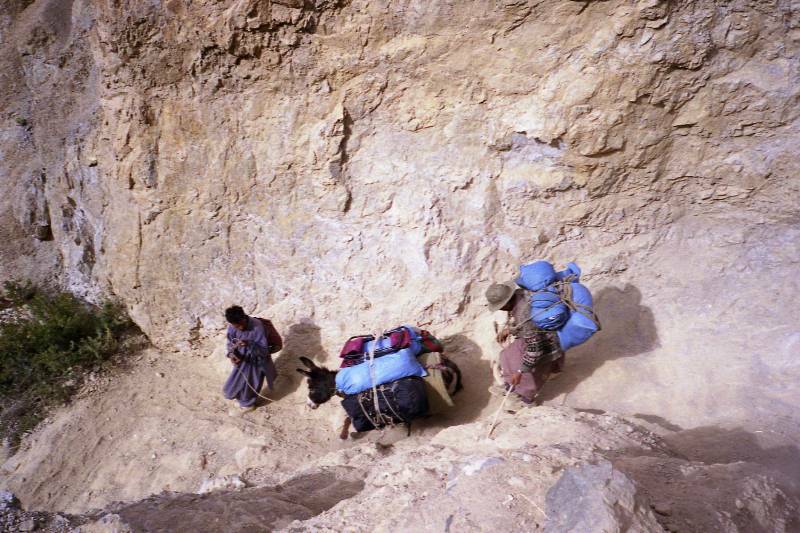 Porters with heavy loads, however, negotiated such slopes confidently without any poles even though they wore light plastic shoes and not mountaineering boots. 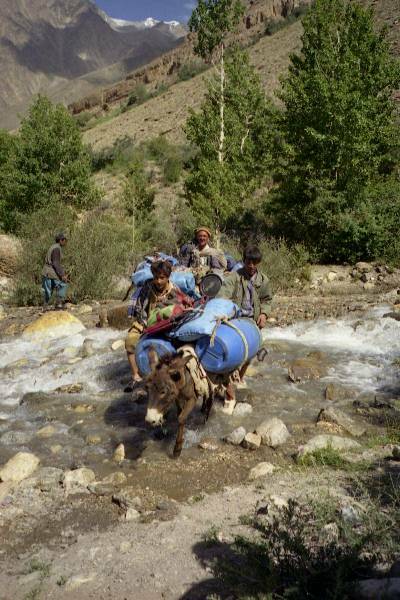 On some stages donkeys and yaks also carried loads. These animals seemed to be fearless even if they occasionally had to be physically encouraged by the porters to pass over exposed ground. 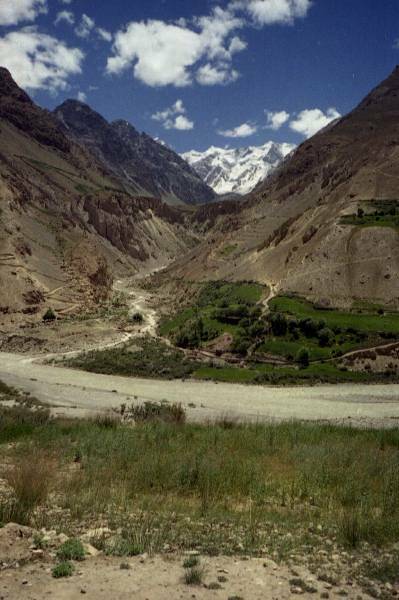 The first pass crossed, Shah Jinali, was flat on top and green with lush grass. 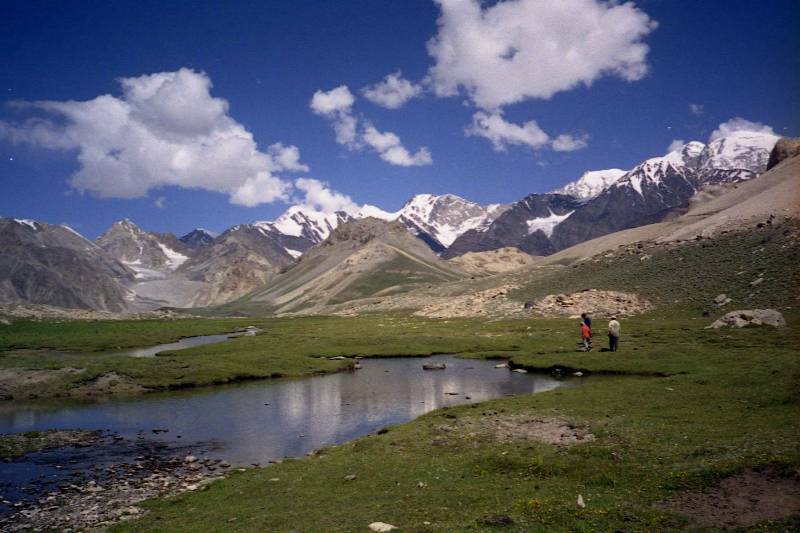 Snow capped mountains in clear blue sky and wild flowers were reflected in shallow lakes – calm and tranquil. After a protracted lunch break lazing in the sun we started downward to our next camp at Ishperu Dok, the weather changed momentarily, the sky darkened with a brief flurry of sleet which disappeared as quickly as it had arisen. Rest day at Ishkawartz, Christopher surveys view. 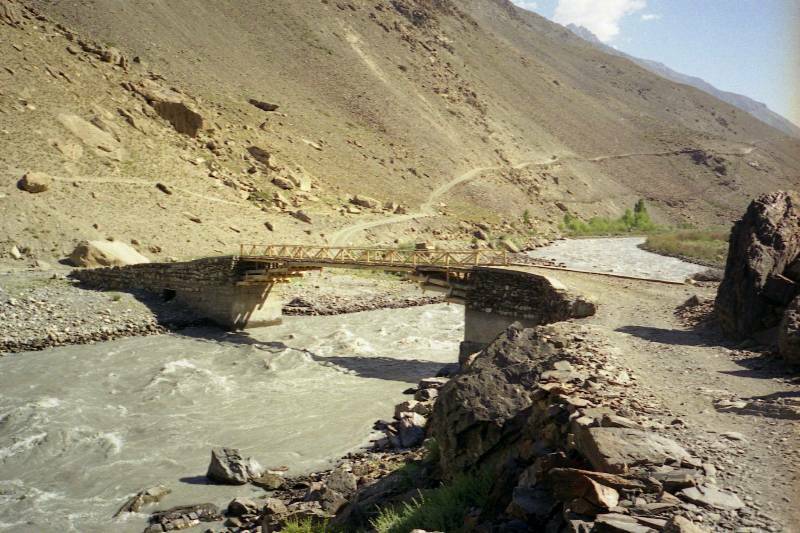 Bridge crossed when leaving Ishkawartz for Showar Shur - impressive cataract seen under bridge and in earlier picture. 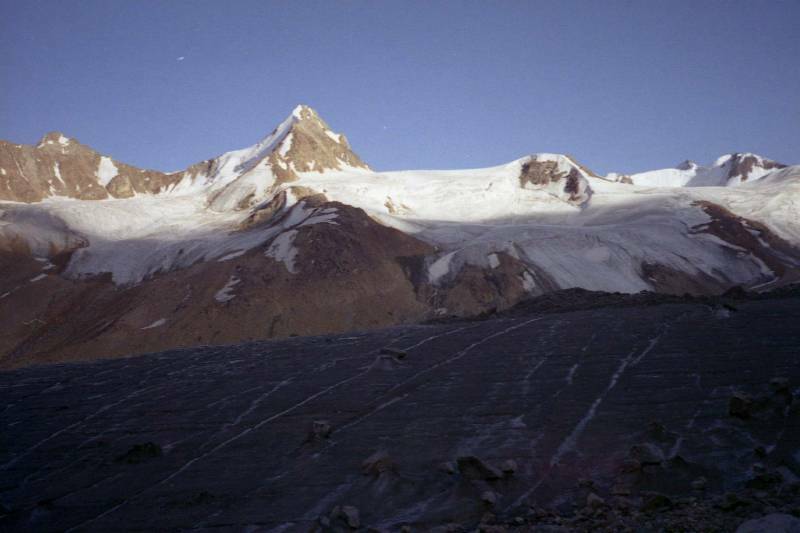 We crossed a glacier on the second Zindikar pass. 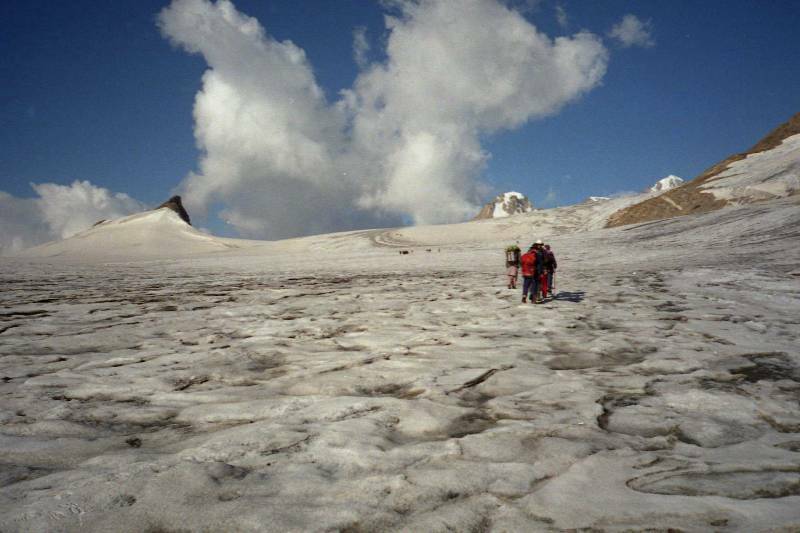 Trekking poles jammed through the thin snow crust into the ice below made moving easier. Crevasses were few and easily seen as we moved cautiously in single file. A real danger was exposure to the sun. Wide brimmed hats were worn and sun protection cream was applied - even to the backs of ones hands - unless gloves were worn which were useful to grip poles. Sun goggles were worn not only against the whiteness on the glacier crossing but also often against the sun’s glare elsewhere. 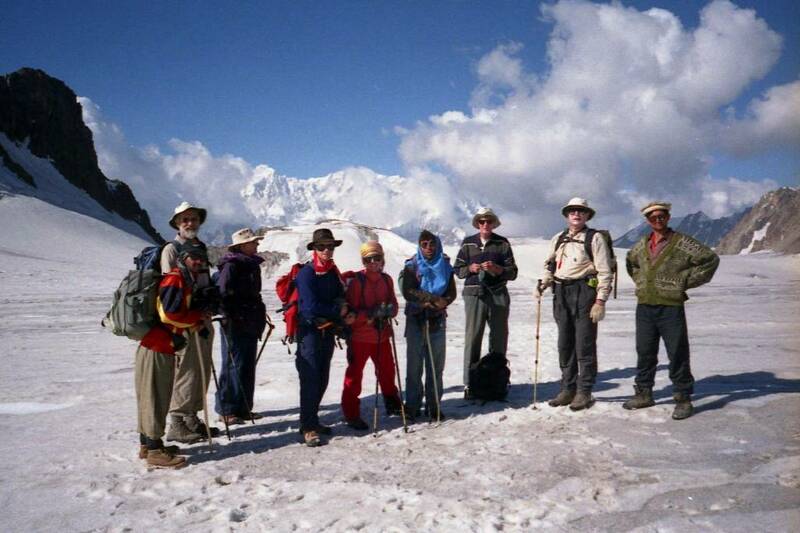 Glasses were issued to the porters when crossing the glacier. 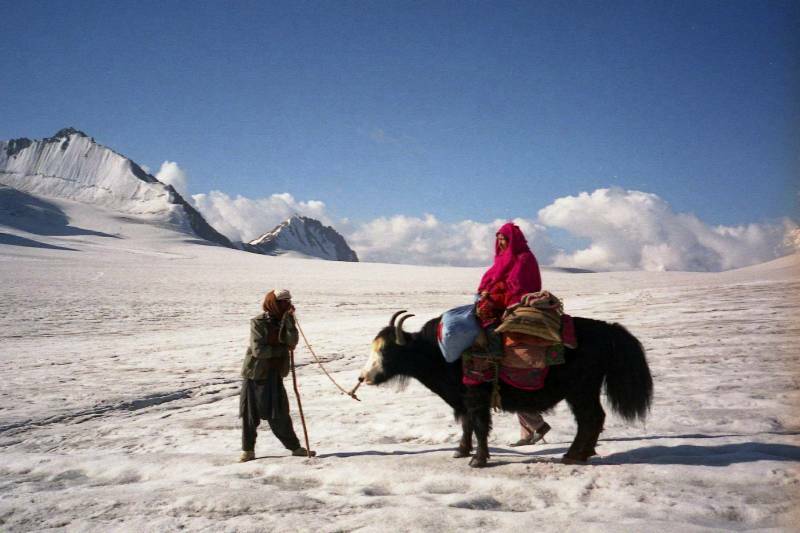 From base camp at bottom of Zindikhar glacier to the top, passing a party of two women descending on yaks returning from medicinal hot springs. 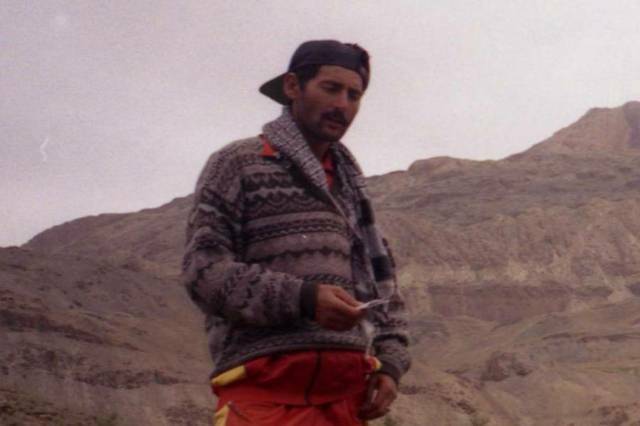 Celebrations and photos at top - 4670m. 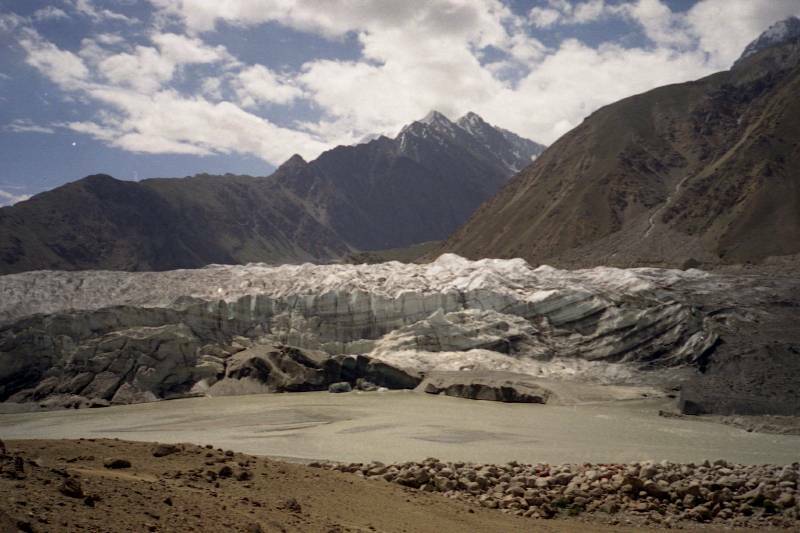 An icy shallow rapidly flowing stream issuing from the melting glacier had to be crossed, precariously, calf deep, fighting against the current. 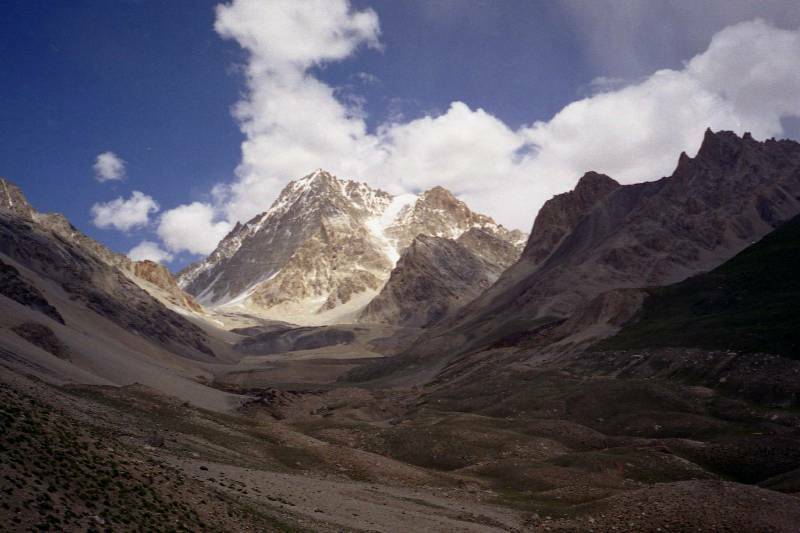 We then descended the long haul down to Rawat and camped for the night. I was woken by the rumble of rock falls in the distance. 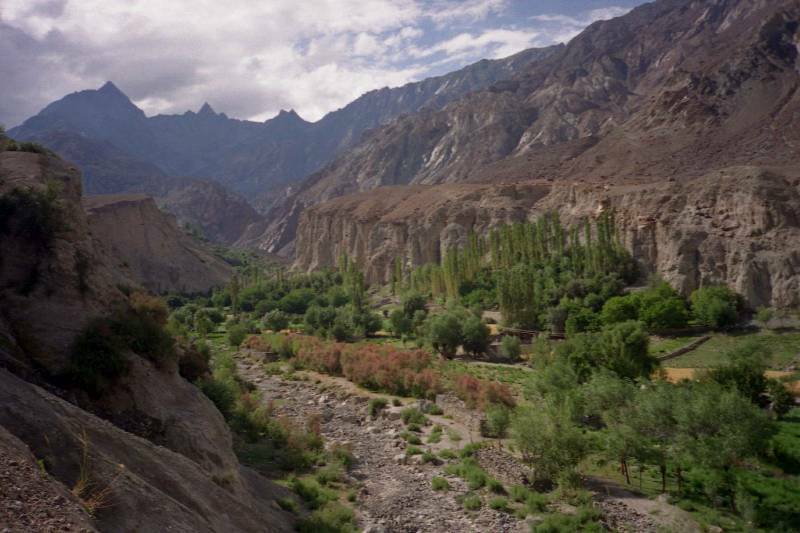 Scenes near Rawat. Tony enjoys an alfresco hot bath. 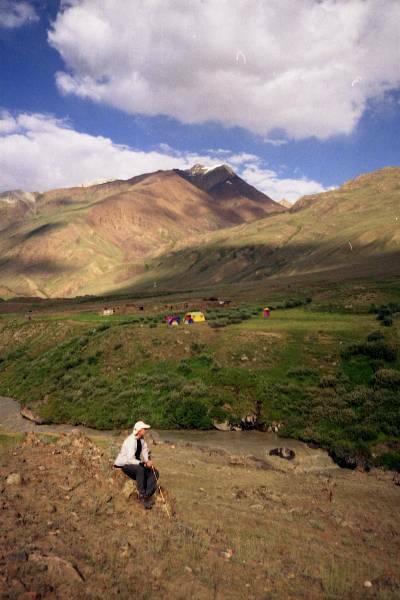 As our next stage to Darkot was short we had the option of lazing for the morning at Rawat or exploring - some of us chose a 7mile round walk with a 500m climb up to the hot springs which the women on yaks had visited. Jean Yves medical clinic at Darkot. 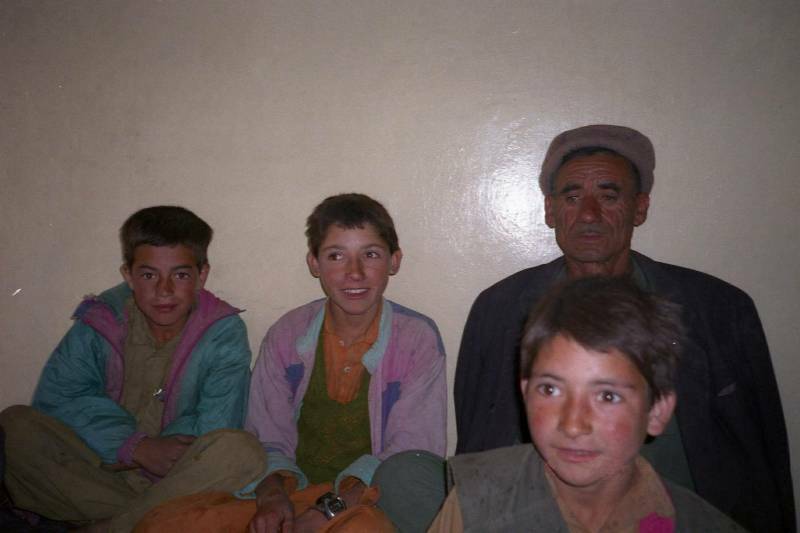 Christopher, Murad, and friendly resident school teacher. 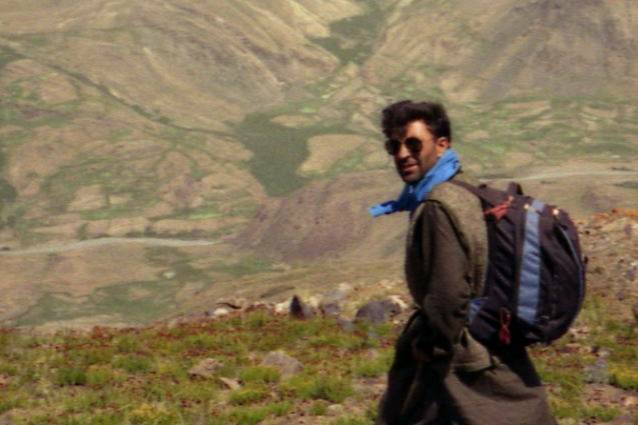 In the afternoon we walked to Darkot and our next rest day. 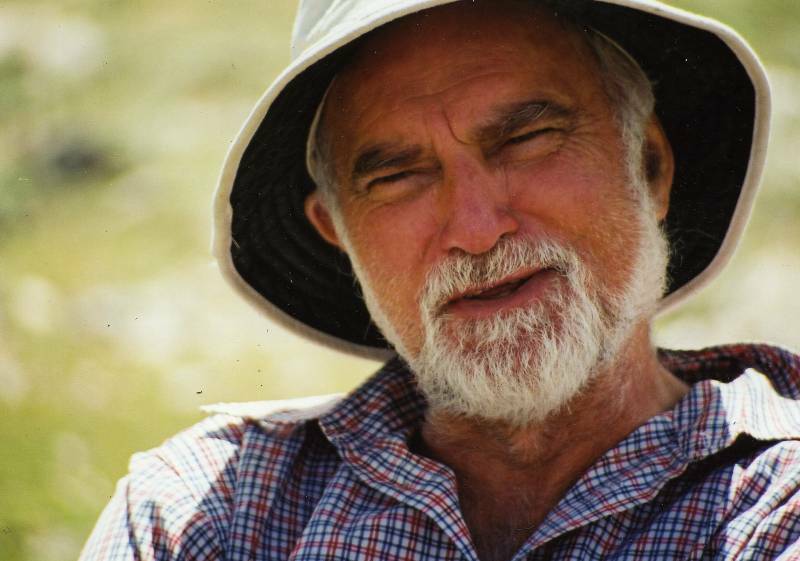 Here (and elsewhere) Jean Yves, a doctor, was sought out by patients requiring treatment generally for minor ills. 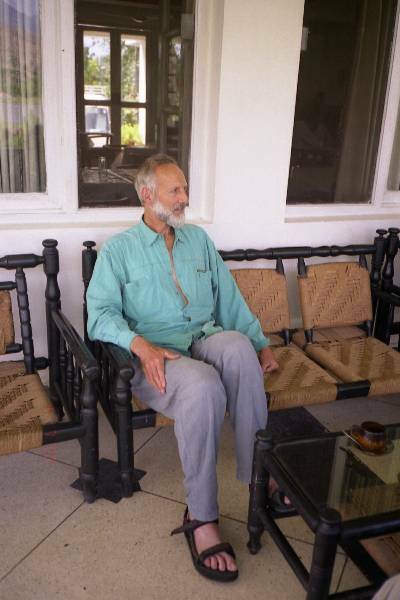 He gave his rest time with patience and good humour. His pharmacist wife Michele had, with foresight, brought a rucksack of medicines for treating ailments. Communicating both ailments and treatments involved translation from the local language into English by Murad, and then from English to French by Christopher, a long process. 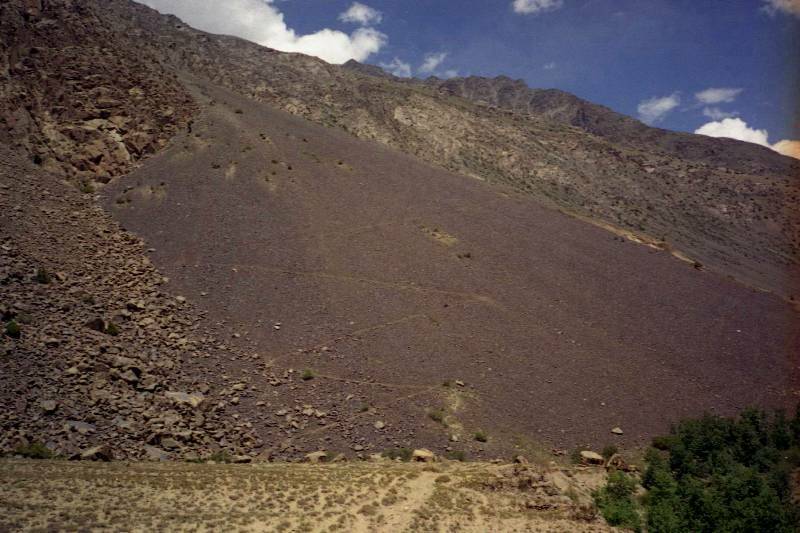 The last pass, the Atar pass, was both steep and unstable for about 300 meters near the top. 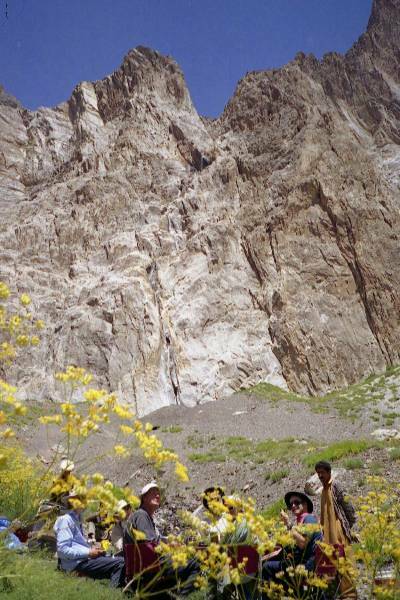 Our boots sunk into loose shale, almost behaving like loose snow, as we cautiously zigzagged upward behind guide Murad leading the way. 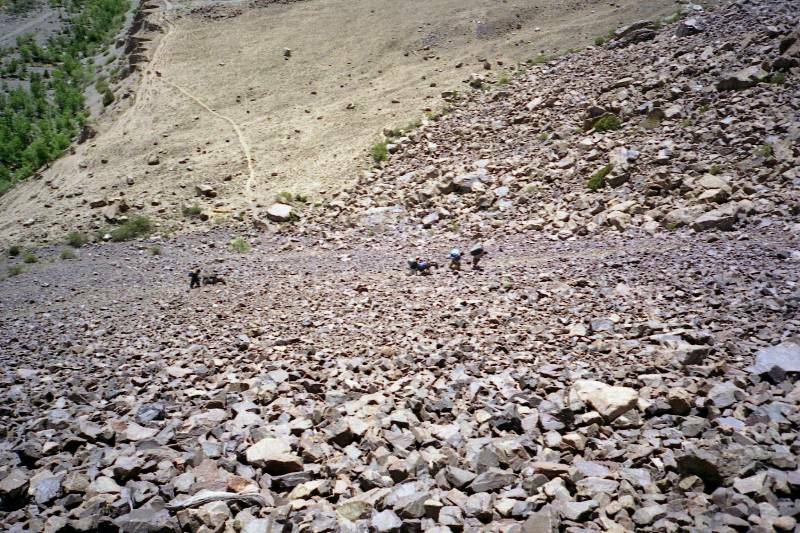 It looked easier to scramble up the rocks at the sides but this rock was friable pulling out in one’s hands as Pyers found when he deviated off the scree. 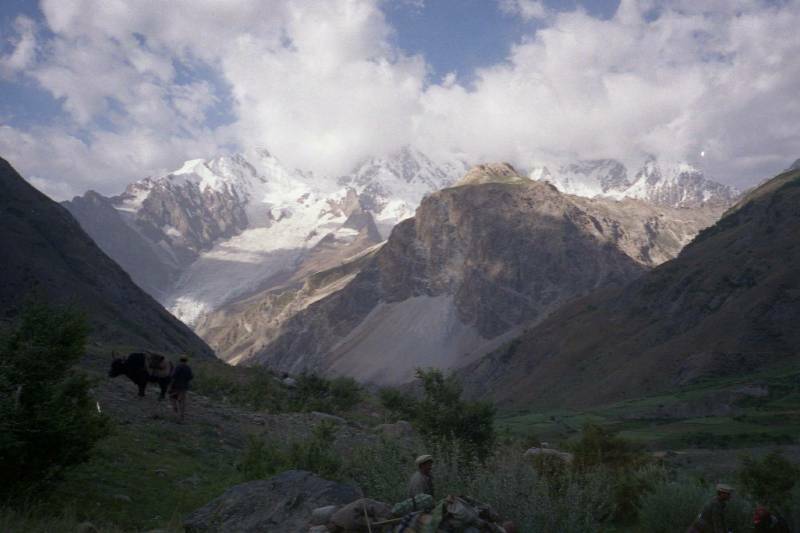 At the crest clouds disappointedly obscured the high peaks Nanga Parbat and Rakaposhi. Michelle and Christopher descending from Atar pass photographed with Atar lake behind. On our descent we saw Atar lake gleaming in the distance. Approaching it, we waded through shallow streams and then traversed around it’s steep slopes to our camp lower down alongside the river emerging from it. Unfortunately I ran out of photo film unable to take pictures until film could be purchased at Dain. 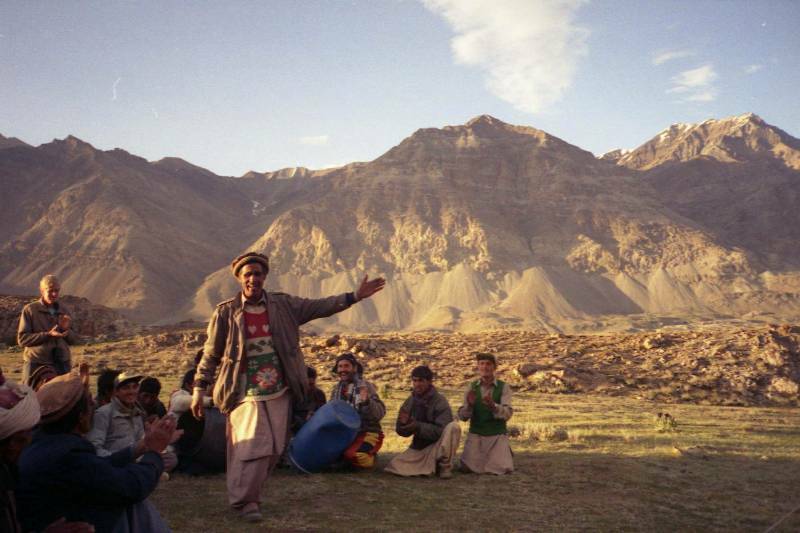 Each evening guides and porters pitched tents for us. Couples shared but single men each had a tent to themselves with ample space for their gear. We had to get used to the hard ground alleviated somewhat by our thermorest mattresses. Only one night was really cold when we piled on layers of clothes – often we slept with sleeping bags unzipped. The weather was mostly warm, sometimes too warm. Setting off in the morning was only twice delayed briefly by rain. 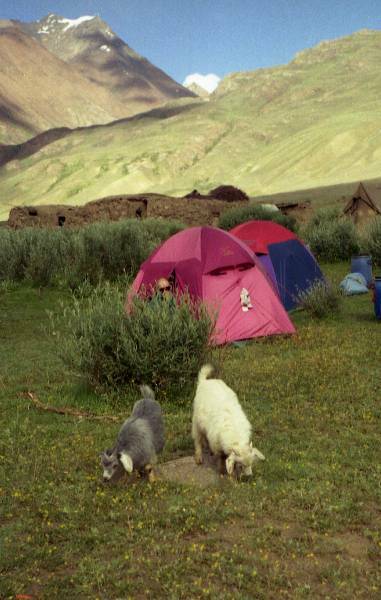 Summer camps for animals and their herdsmen in the high mountain areas. 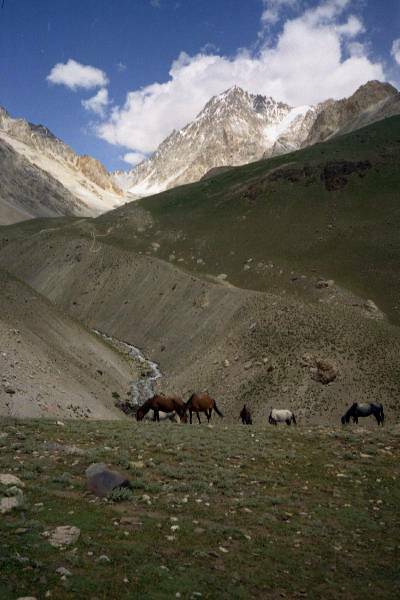 In Spring, herdsmen with their families move from their permanent winter villages into rudimentary summer villages in the mountains with their herds of goats, sheep, cattle, yaks and horses. 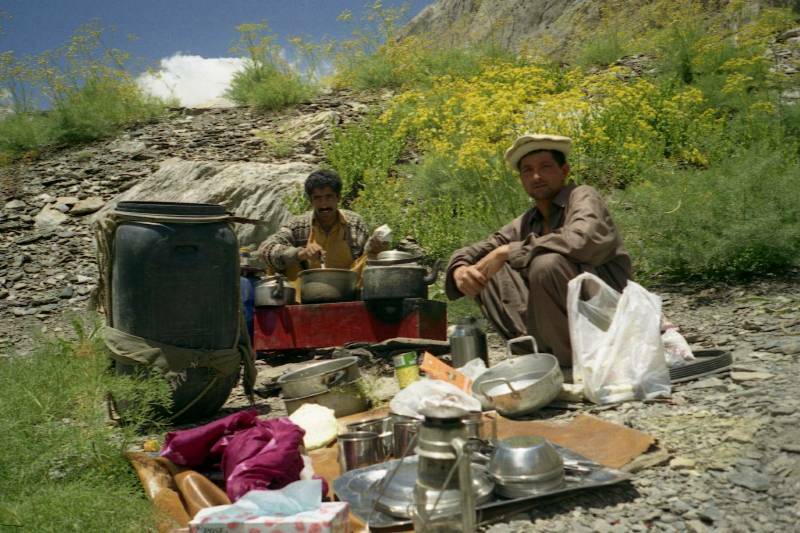 Villagers would hospitably offer us curdled milk and chappatis. It appeared to be a tough life. 3 full meals were provided daily – fairly basic but adequate. Porridge or cornflakes in the morning with usually a boiled egg and honey or jam spread on chappatis. For lunch the cooks usually set up their paraffin stoves en route and often prepared a pasta dish with tomato sauce. We also munched biscuits with tinned mackerel. In the evenings we had soup with chappatis, rice, a vegetable curried dish and dahl (and sometimes chicken or mutton) often followed by an English dessert, custard or jelly, but sometimes by fresh apricots or white mulberries. 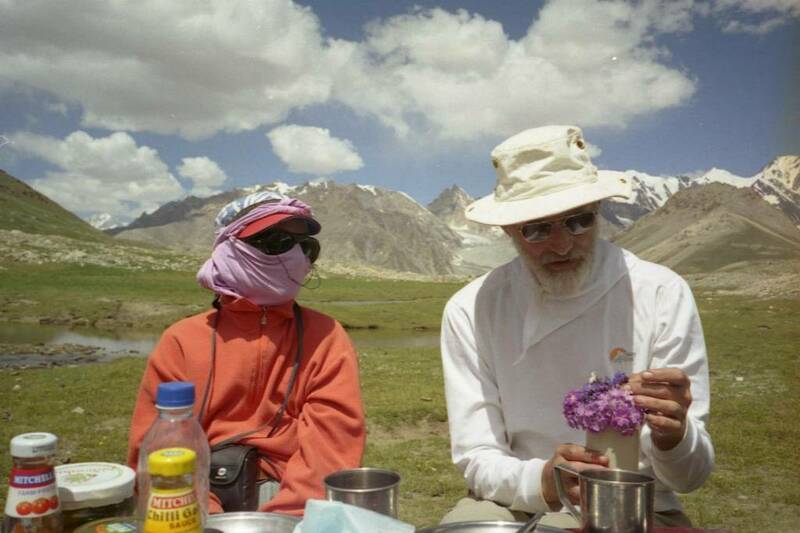 Meals were washed down with cups of pleasant hot green tea, possibly imported from China - we did not fancy strong black tea boiled together with milk and sugar, a popular local beverage in parts of Pakistan. 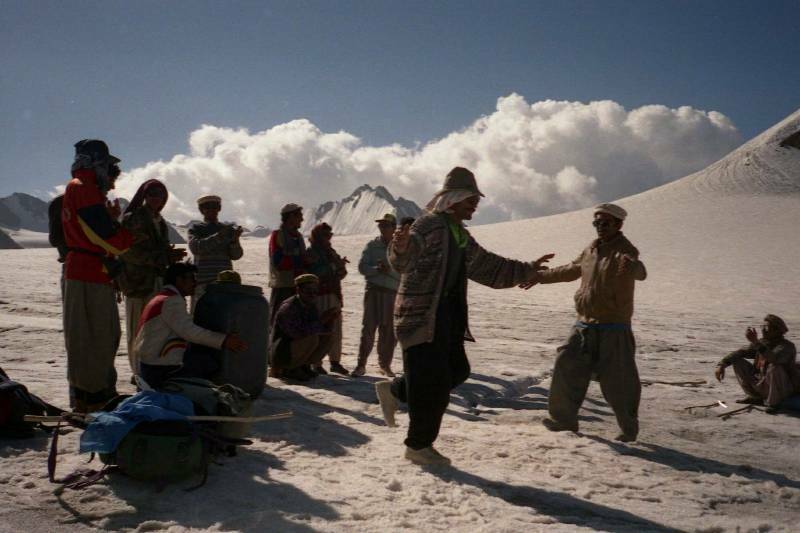 While sitting at table, waiting for a memorable lunch at the top of the glacier crossing, the porters celebrated by breaking out into song and dance. Adjusting to camp loos (a trench surrounded by a tent) took some time – our European knees were initially weak. If caught between camps we were urged to burn toilet paper to avoid despoiling the countryside. Washing oneself was also challenging – crouching inside a tent besides a tiny plastic basin filled with warm water was awkward. We looked for secluded bathing spots alongside rivers and springs not overlooked by porters or villagers, but the water was freezing cold. On a rest day, after an upward climb rising 500m in about 3½ miles and taking several hours, 4 of us reached a sulphurous hot spring – here I had a glorious soapy bath. 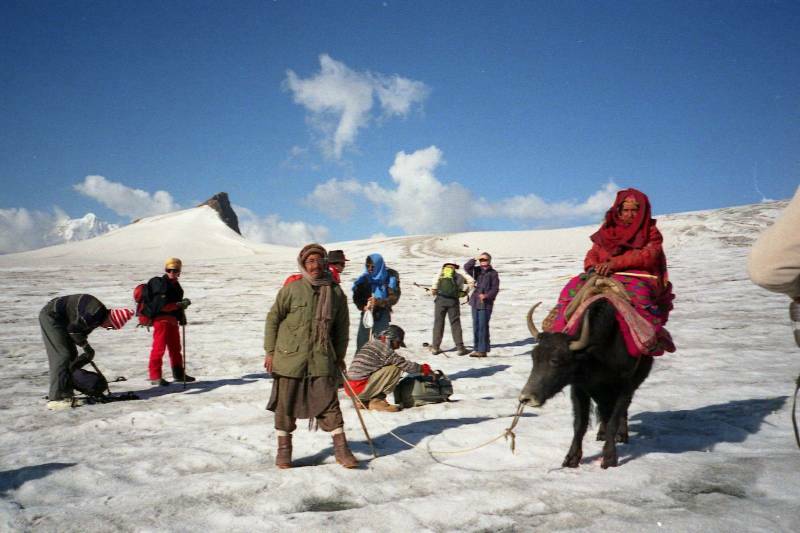 On the day before we had met a party descending the Zindikhar glacier with two women who consulted with Doctor Jean Yves while seated on their Yaks. 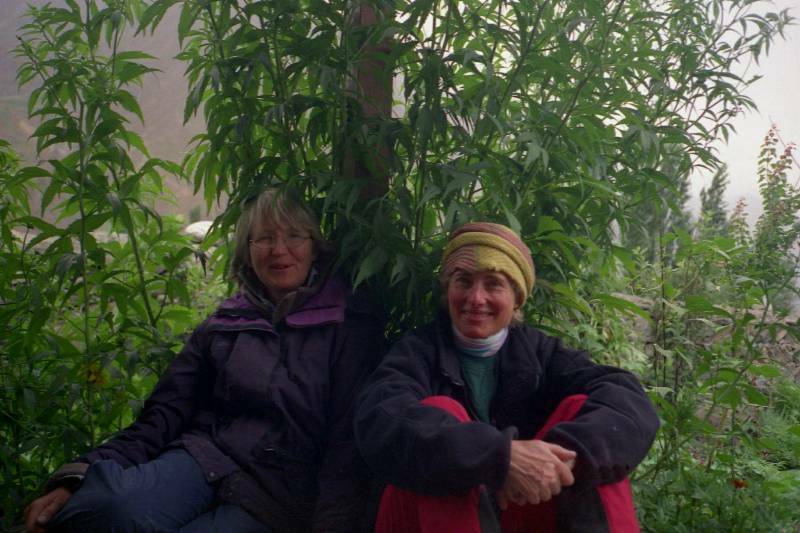 These women had just been to the same hot spring to take a medicinal bathe. Stupidly not one of our trekking party had the foresight to bring clothes pegs. Washed clothes had to be hung over guy ropes or improvised lines without pegs and thus often blew off. Silt laden mountain streams thundered down valleys to the sea. 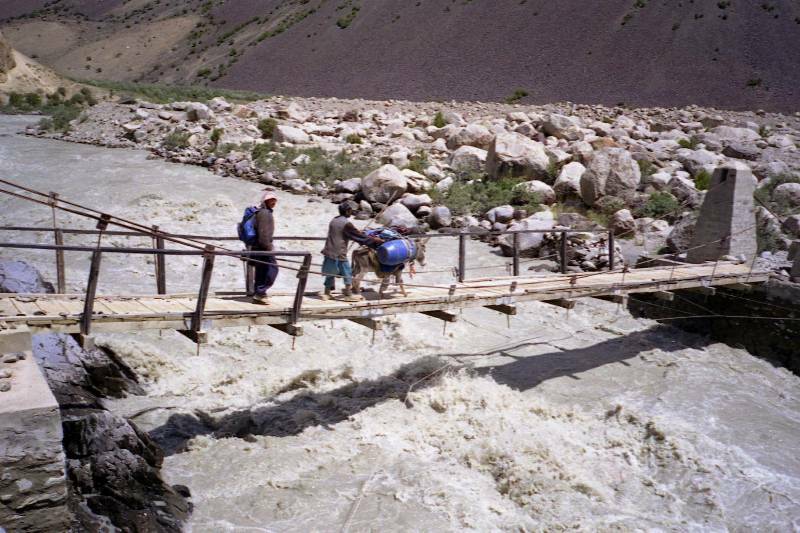 Precarious bridges made of poles, brushwood and stones had to be crossed. Smaller streams, where possible, were jumped across, if not they were waded. Trekker sandals cushioned my feet against the slippery rounded stones while my poles assisted in maintaining my balance against the current. 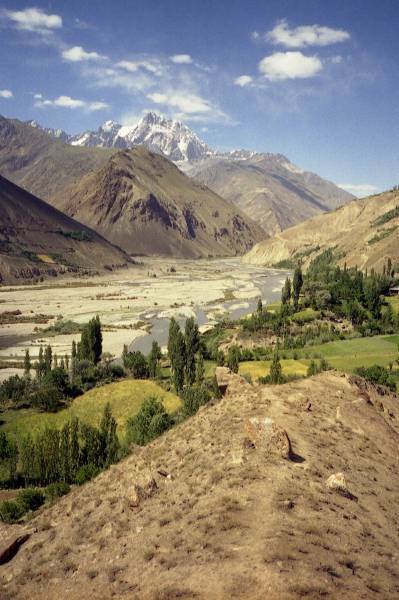 The whole Hindukush country seems to be a mountainous semi-desert in which the people have created many oasis’s. 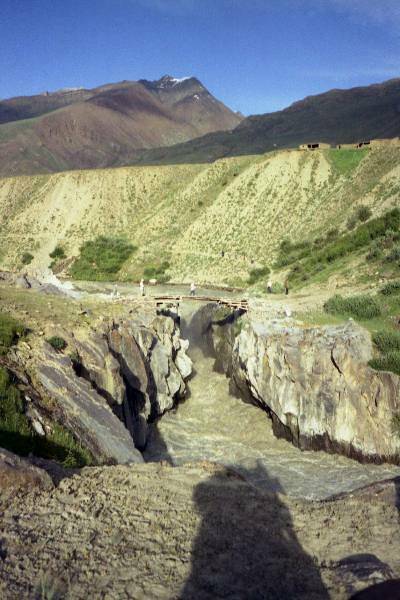 Fantastic irrigation ditches had been hewn by communities on the sides of steep mountain slopes from water sources (rivers or springs) to fields. Wheat, barley, corn, vegetables, walnuts and fruit, especially apricots, are grown. 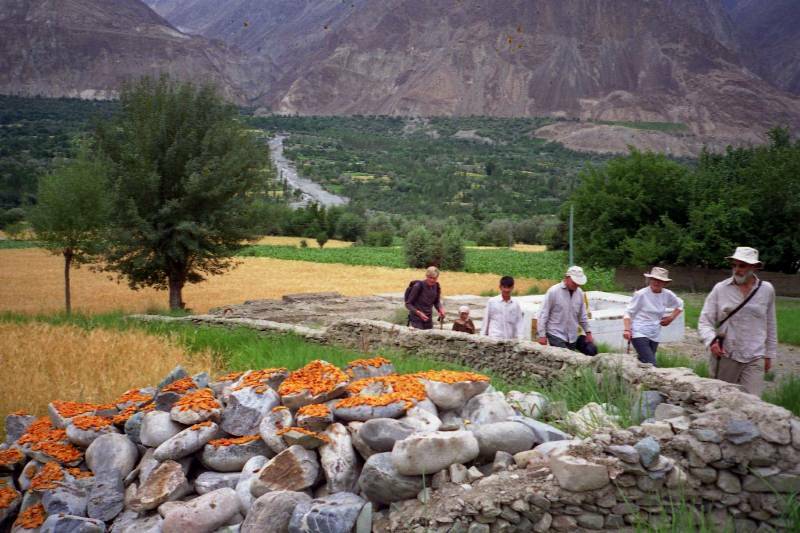 Apricots were being dried yellow in the sun on the roofs of houses or on rocks. Murad, who farms in this area, told me that they had tried American seed but had stopped using it as new seed had to be purchased each year - harvested seed was infertile if replanted. 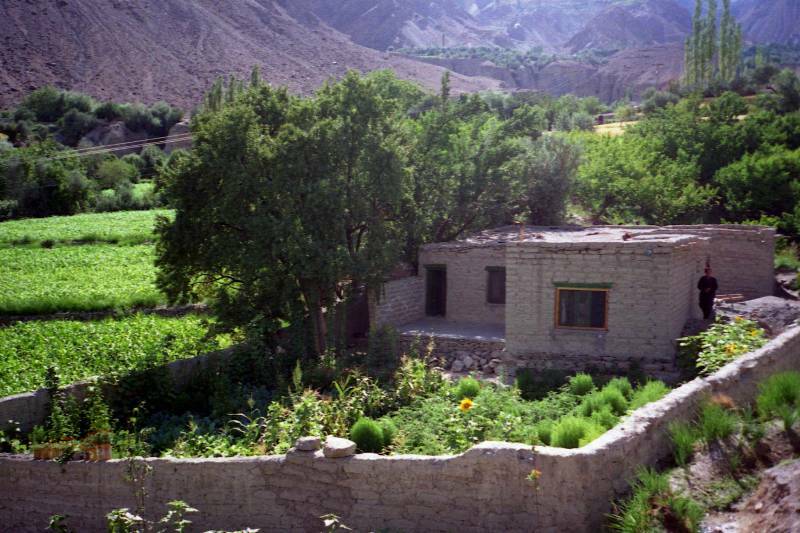 Poplar trees had also been planted mainly over the past 30 years making swathes of green at village settlements. 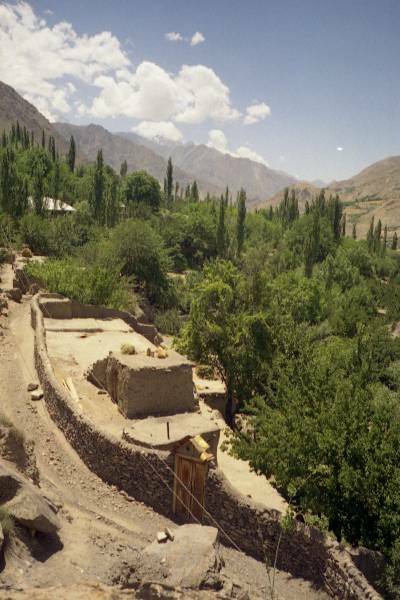 These settlements were very pretty in summer but no doubt harsh and cold in winter. 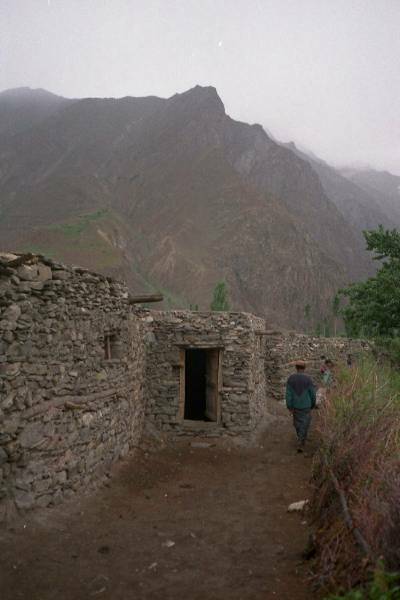 Many homes were built largely from timber poles and mud. These were heated by open fires, holes being left in the flat roofs for the smoke to exit. 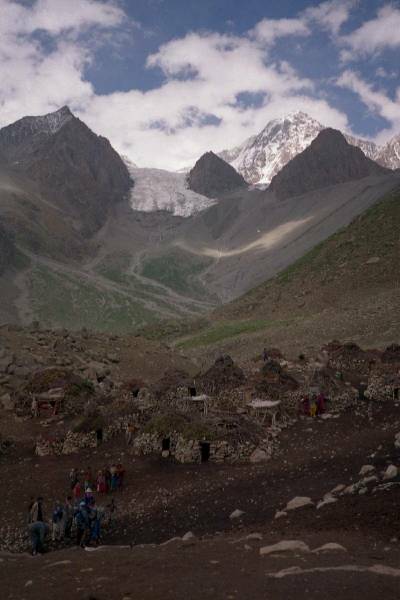 The people mainly encountered during the trek were Ismaeli Muslims. 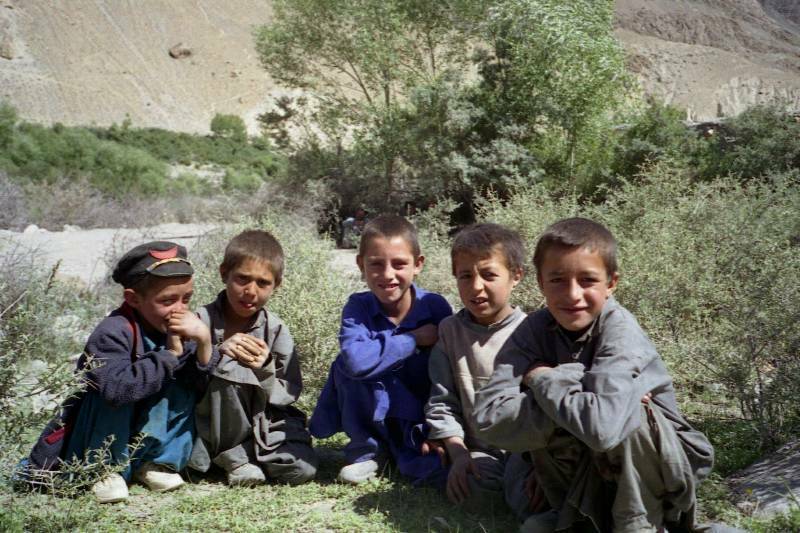 Wives and daughters were less adverse to being photographed than more purdah Muslims encountered elsewhere in Pakistan. 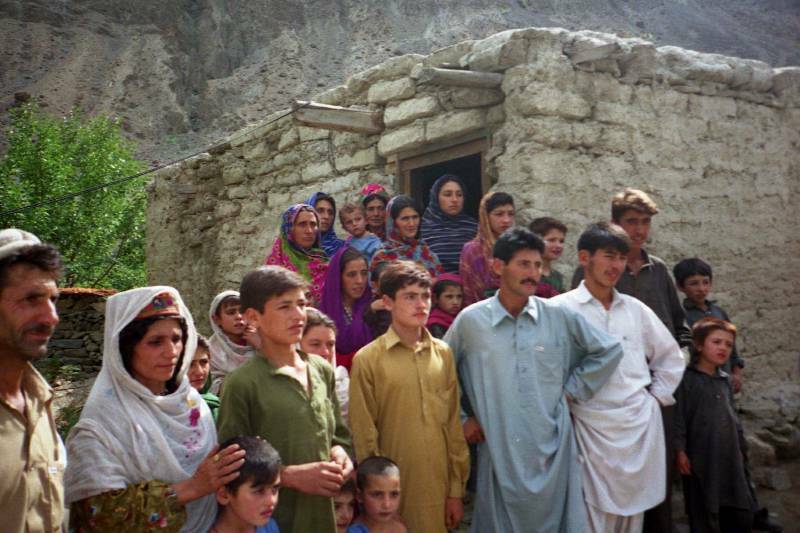 In many of the villages the Aga Khan Foundation was running private schools encouraging the education of girls who had to be 65% of the enrolment since in some state schools only boys are enrolled. 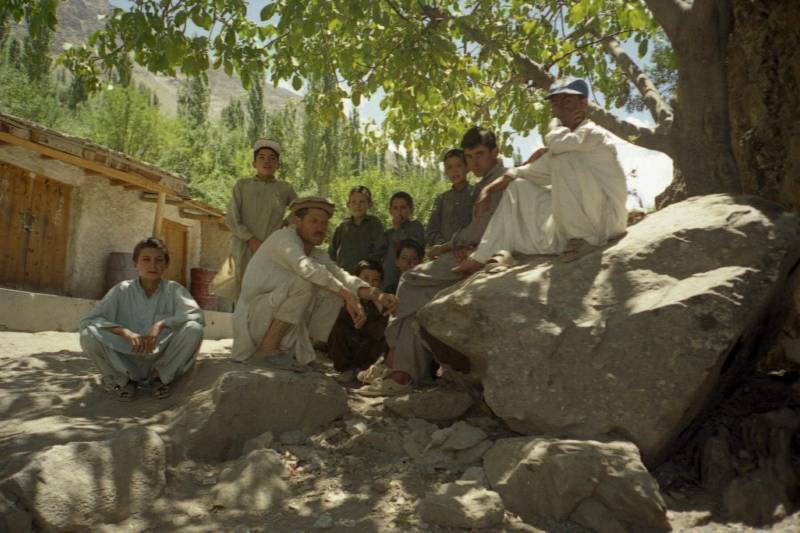 Interestingly English was also taught at these Aga Khan schools and the young children in remote villages were keen to practise on us. Fortunately I avoided all stomach upsets although some members were mildly affected. I purified water initially with iodine drops, but later when we were deeper in the mountains we found obviously pure springs uncontaminated by animal droppings. I filled my water bottles from these or used surplus tea remaining after meals. Murad and Jean Yves developed tooth abscesses which antibiotics, after several days swelling and pain, cured. I developed a severe blood blister under my big toe nail after descending rapidly from one campsite. 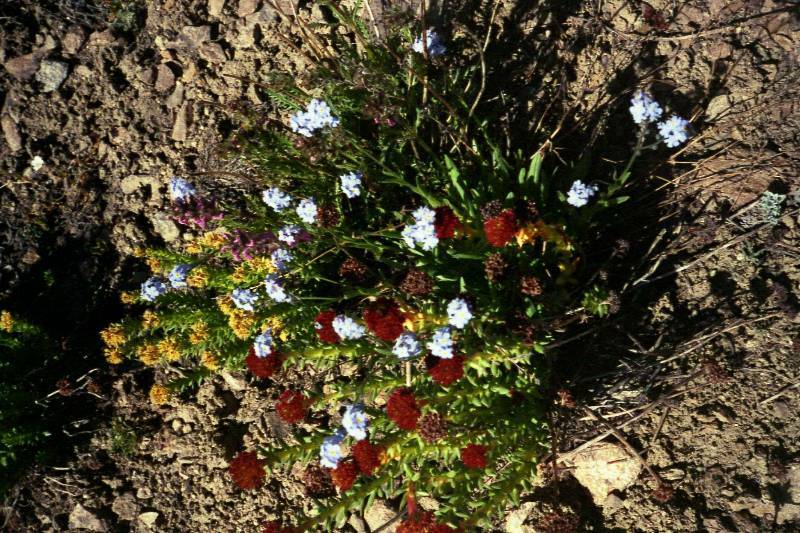 Unless really required on jagged rocky terrain I abandoned my boots and used my trekking sandals quite comfortably. Fortunately there were no snakes about. I had to wear socks with the sandals to prevent my feet sun burning. 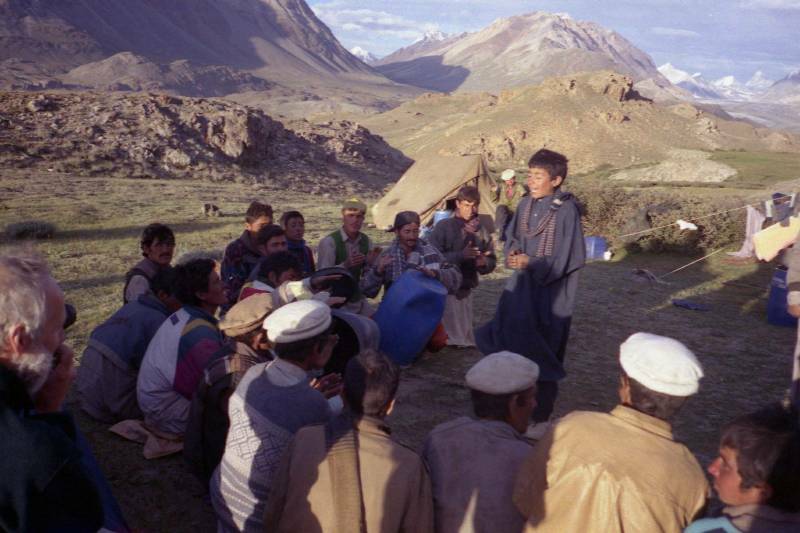 We were totally out of communication with the world, no mobile phones or radios were carried and would in any case not have reached civilisation. If an accident occurred we would have had to send out a ‘runner’ to a village outside, but not all villages had communications other than a possible jeep. There had been talk of providing a money deposit to the Pakistan army to facilitate helicopter evacuation, but without effective communication this seemed rather pointless – we decided to take our chances. A portable satellite phone with a dish could be considered for future treks but the advantages would have to be weighed against the pleasure of escaping daily news and of being truly isolated. 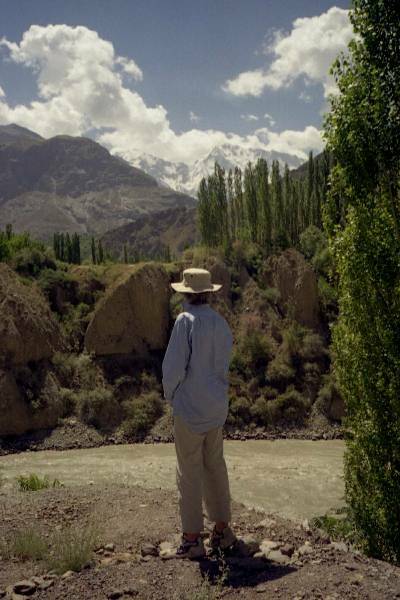 During the trek we all took many photographs of mountains, glaciers, streams, wild flowers, companions, local people, their houses and domestic animals, and in addition Jean Yves also video recorded the journey. All these are a reminder of a worthwhile experience. 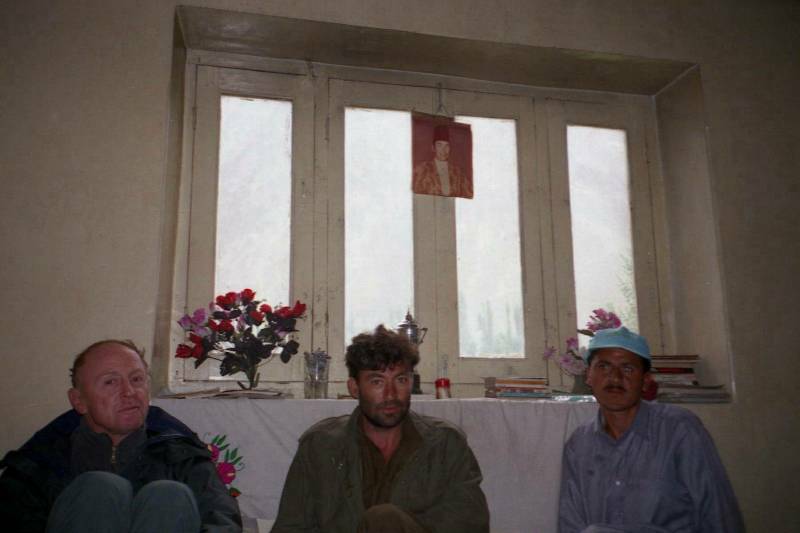 The party had maintained harmonious relationships. The biggest disagreements were, in the absence of a dictionary, whether certain words were acceptable when playing scrabble before our evening meal. Our party of oldies was pretty fit, some walked faster others slower but all arrived in reasonably good shape at the end of each stage. I lost 3kg in weight and an incipient paunch. 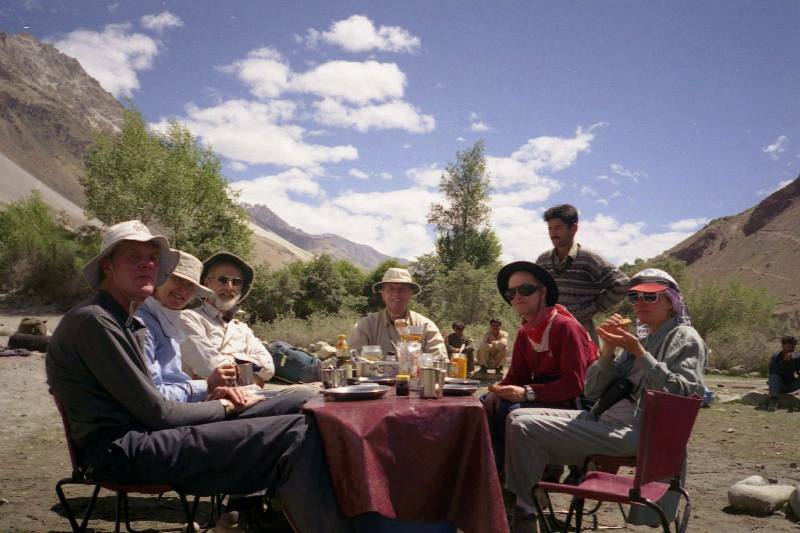 The guides, cooks and porters had all been pleasant. We had been treated at a teacher’s home at Darkot during a rest day with traditional pancakes with sugar. 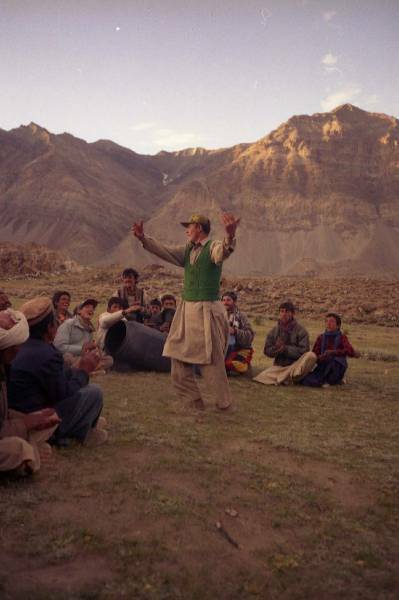 Later at our last campsite at Dain, we met our chief guide Murad’s father and daughter and at Jagir Khan’s home we feasted on a traditional meal sitting on the ground with a tablecloth bedecked with food. 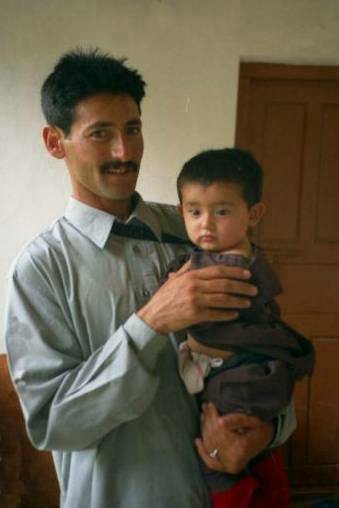 We photographed Jagir proudly holding his young handsome son. 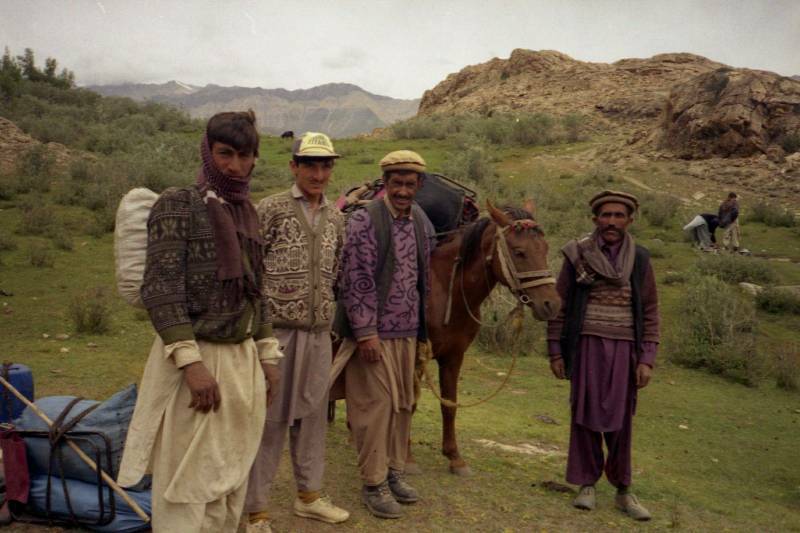 The next day we travelled by jeep to Gilgit where we stayed overnight and shopped in the bazaars, buying Afghani carpets. 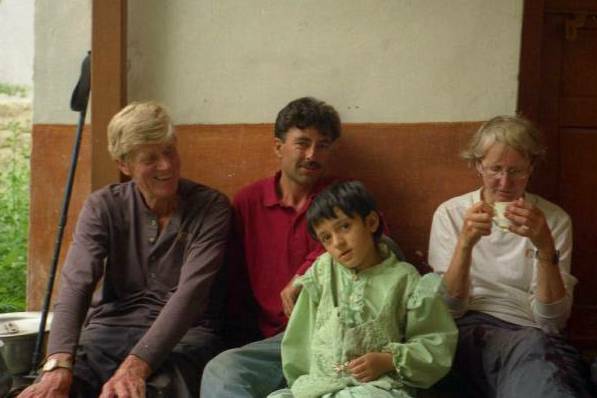 Last rest day at Dain - Murad with daughter, Jagir with family and friends and with his youngest son. 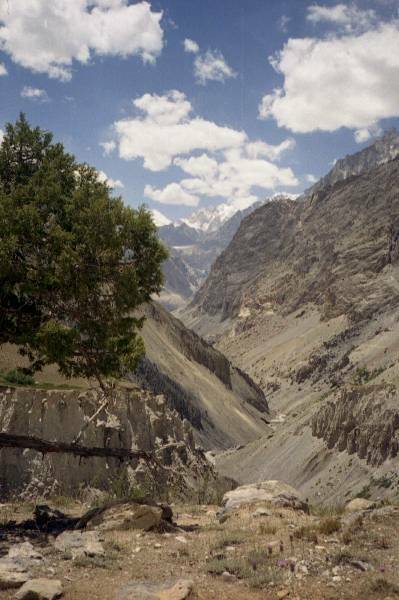 By bus from Gilgit to Islamabad took a mammoth 17 hours after an early start in the dark. 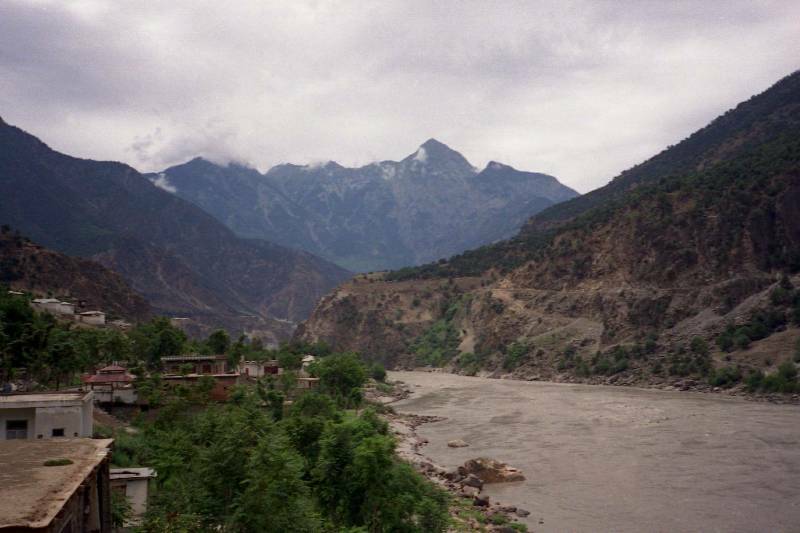 A road had been heroically cut, with aid from the Chinese, into the steep mountain slopes falling into the Indus River. 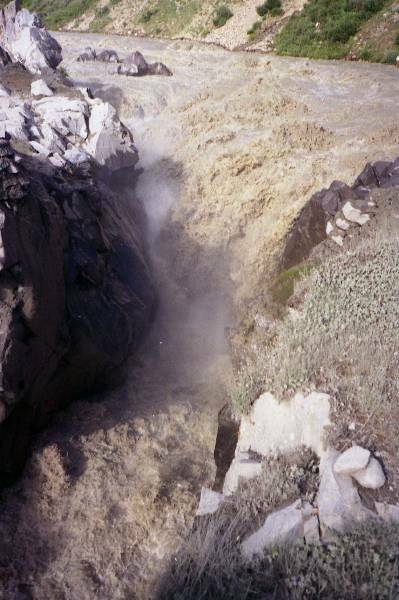 Constant clearance of rock falls from the road and replacement of bridges seemed to be required. 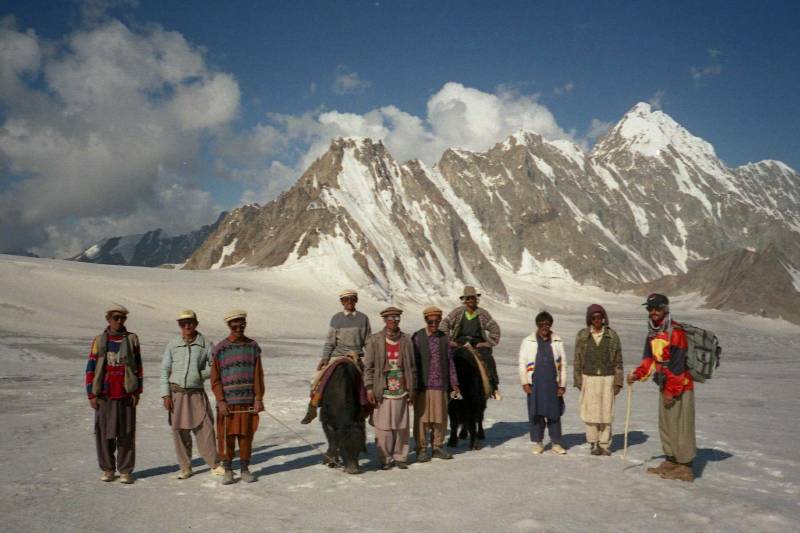 Travelling in Pakistan is understandably not easy. 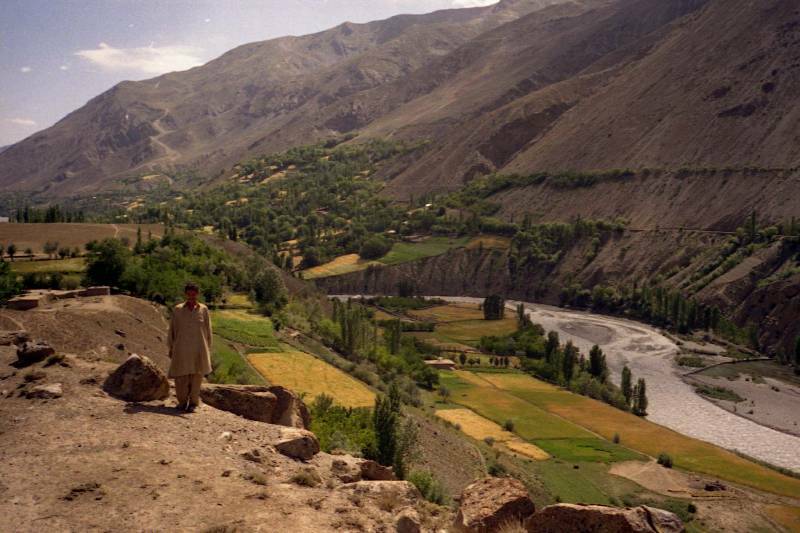 Down along the Indus river. I flew back to England the next day after little sleep. Cancelled connecting flights from Heathrow to Manchester and delayed ‘express’ trains from Manchester to Sheffield were a reminder I was back home. After resting for about 5 days I started walking again in the Peak countryside near Sheffield – a little more restful than the Hindukush. 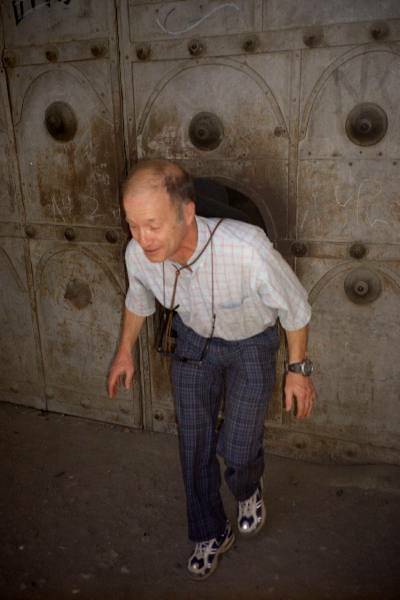 Pictures were taken rapidly 'point and shoot' with an easily portable small Olympus camera, negatives were digitally scanned 7 years later on an Epsom stylus PHOTO RX500 and pixels reduced for web and any touch up or cropping required by using Photosuite 7. Possibly also arising from nostrils drying out, cracking and bleeding when blowing ones nose.